I have been thinking of culturing my own phyto for a while now.. recently my local store stopped selling some fresh cultures so i decided to try out my own. Ideally one would start with a specific strain however there was slim pickens where i live so i decided to go with the only live culture i could find. 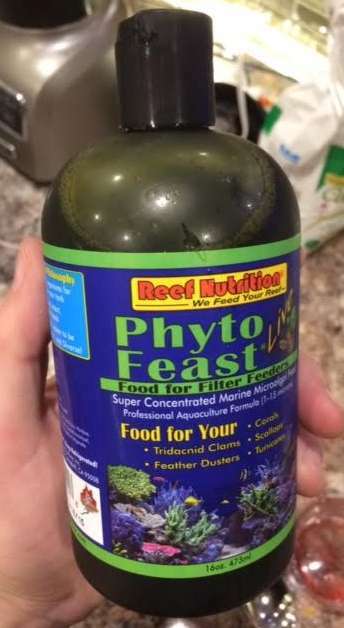 I found a nice big bottle of phytofeast to get started. 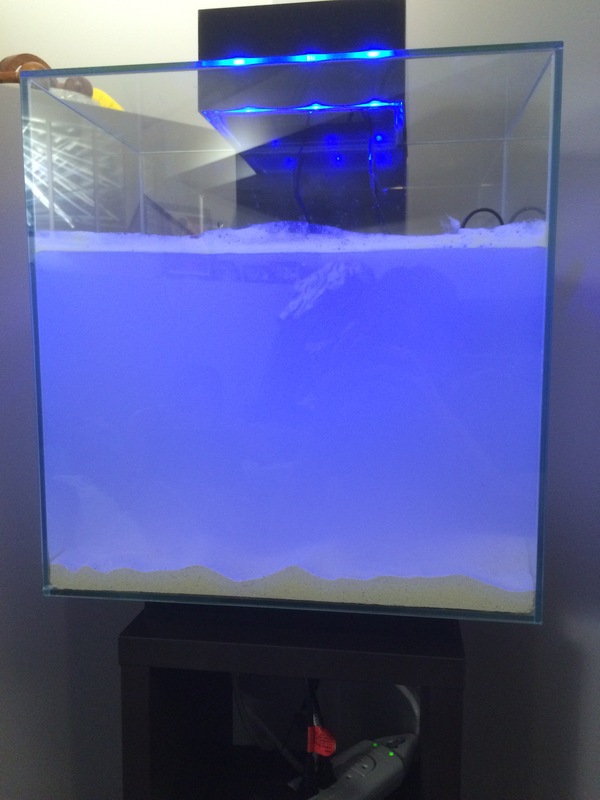 I mixed the salt water to around 1.019 – 1.020. 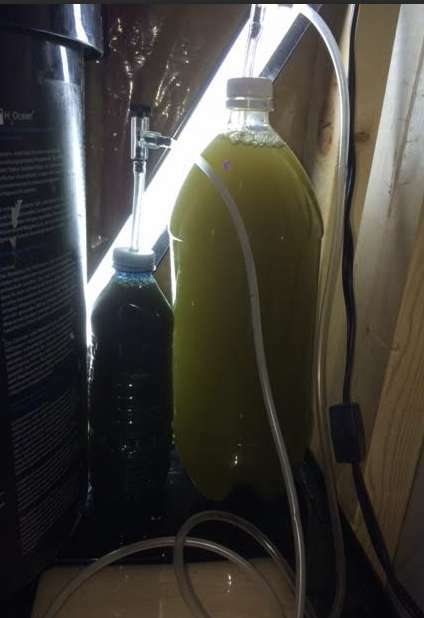 For the fertalizer I decided to use miraclegrow for the first batch (and ordered some F2 for future cultures). 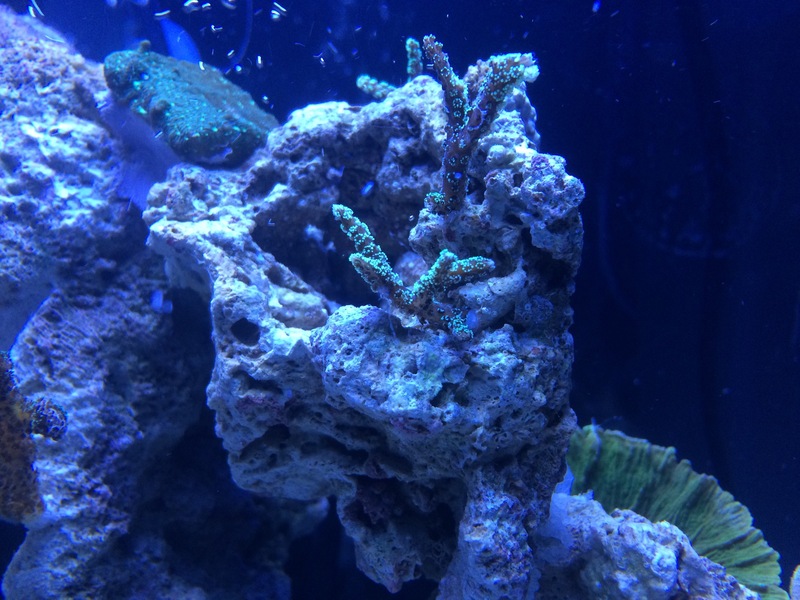 I absolutely love my fusion 30L reef, however it has quickly become packed due to my slight coral addiction… Now i could just sell some frags but thats just not as fun.. so what to do? 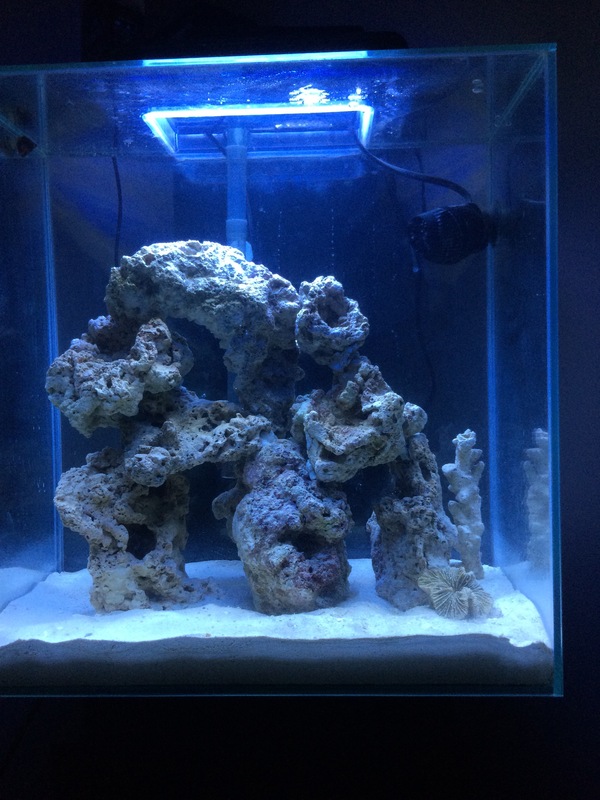 Well im in the process of planning a 6′ long shallow reef. 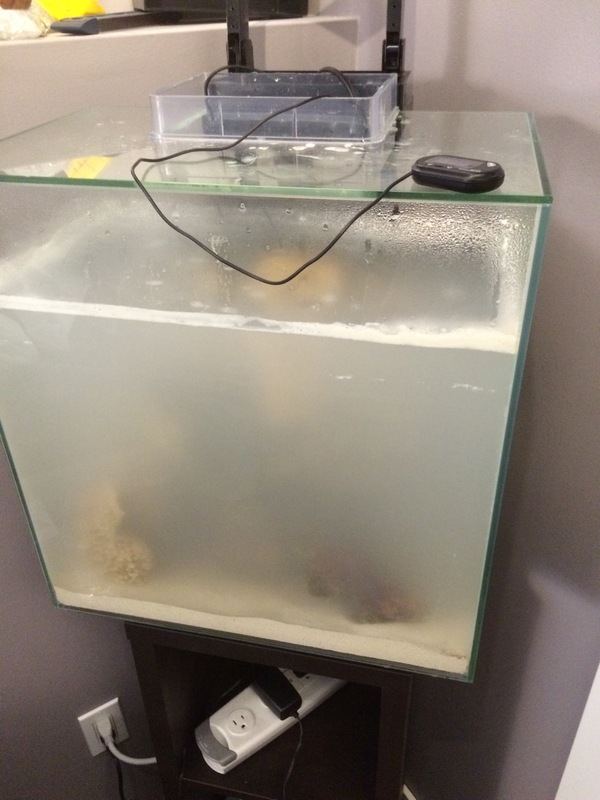 The tank will work out to 90-110 ish Gallons. 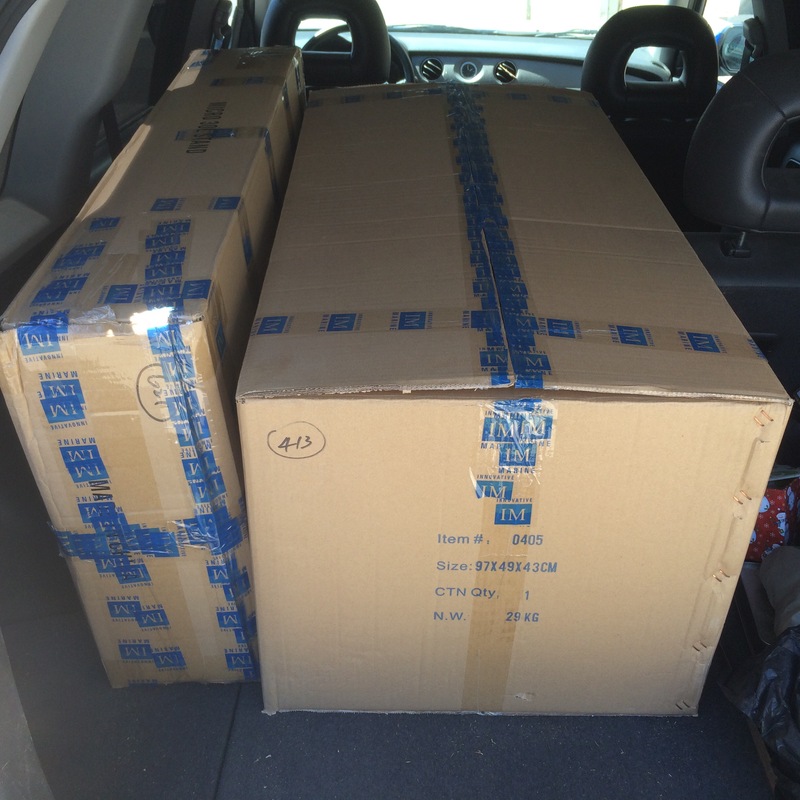 IM looking at 5.5-6′ x 18″ x 18″. Still lots to plan and figure out but I will update this as i go and plan. 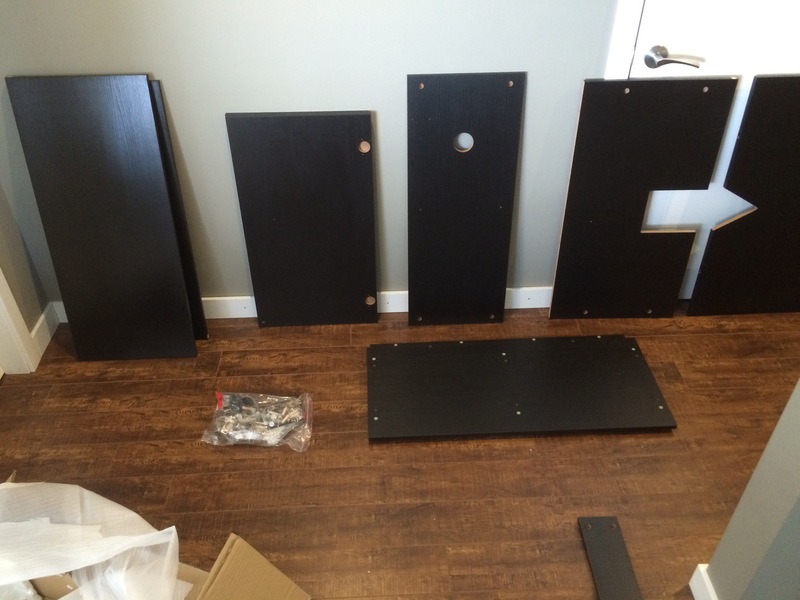 I’m hoping to have an L shape bar to mount it all. 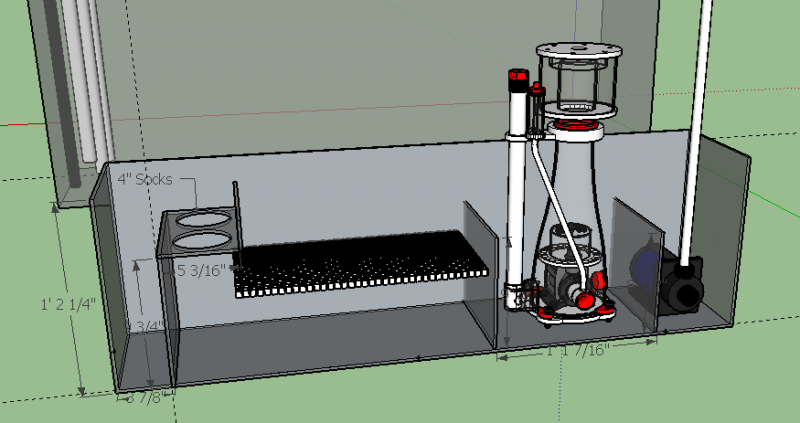 Im still trying to work out the pipe size to support the weight and prevent sag. 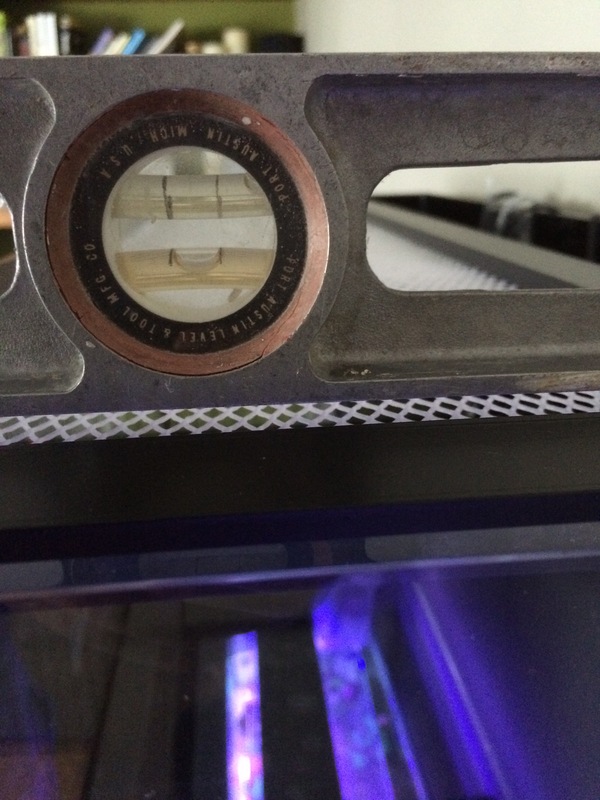 I belive 1″ aluminum bar would work..however i may need to add a little support bar at the 90 degree corner. 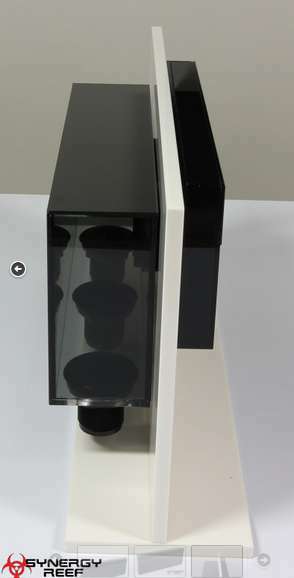 The back section will be a removable U shaped black plastic or glass to hide allthe over flow and still allow easy access. 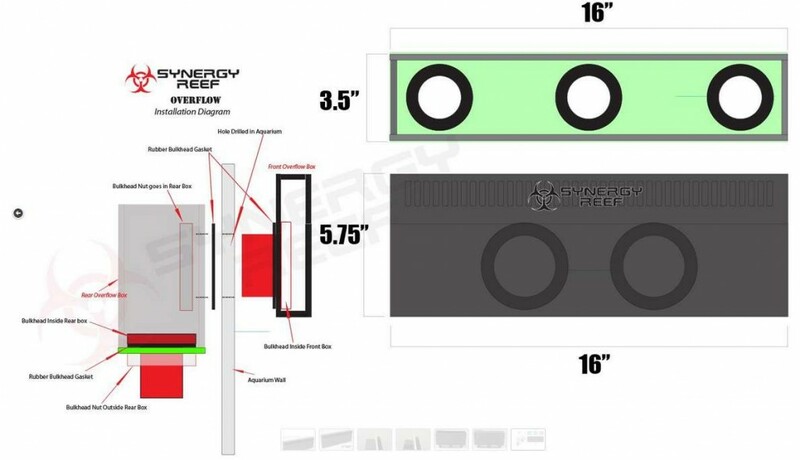 I will likely have a Mp40 on the side wall for flow (and probably an MP10 since i already have one! 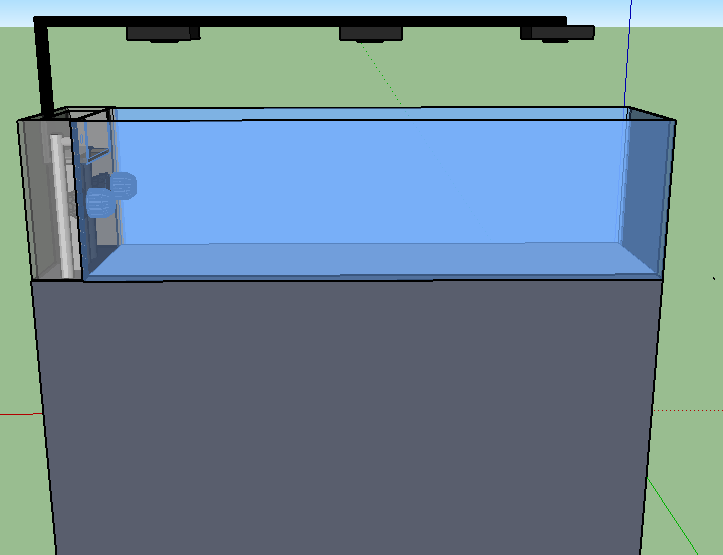 For the overflow im debating between just adding one onto the tank when its built or going with the synergy. 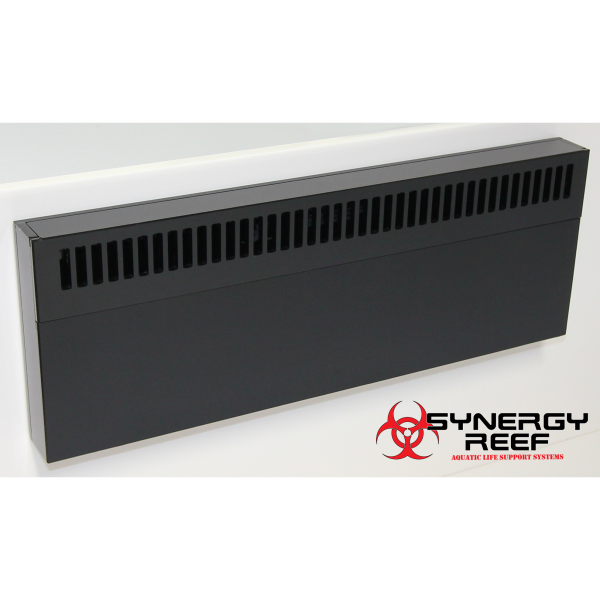 The synergy overflow looks very sleek.. 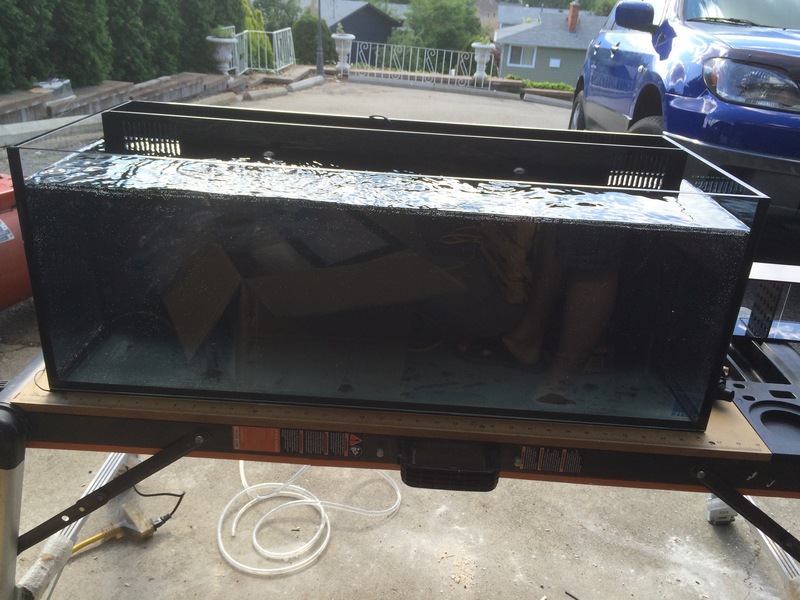 The only possible issue is the overflow is 16″ wide leaving 2″ ish inside on the edges with likely isnt enough space for the bulkhead for the return line.. 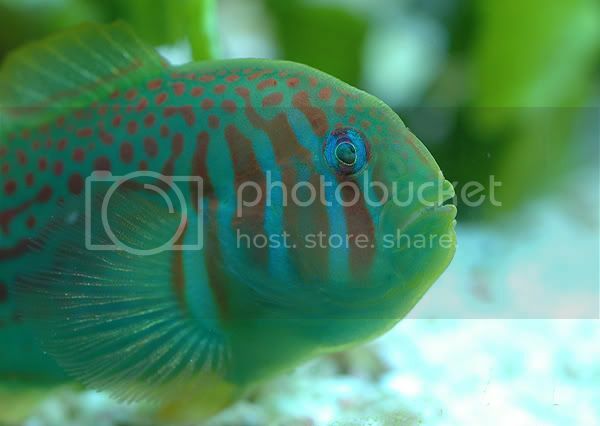 I may need to but the width up to 20″ or just get an overflow made with the tank..
Update: With the bean Animal overflow you want a constant flow rate… so as lovely a vectra is I would not be able to take advantage of most of the features.. I will likely go with a Jabeo DC pump for now. 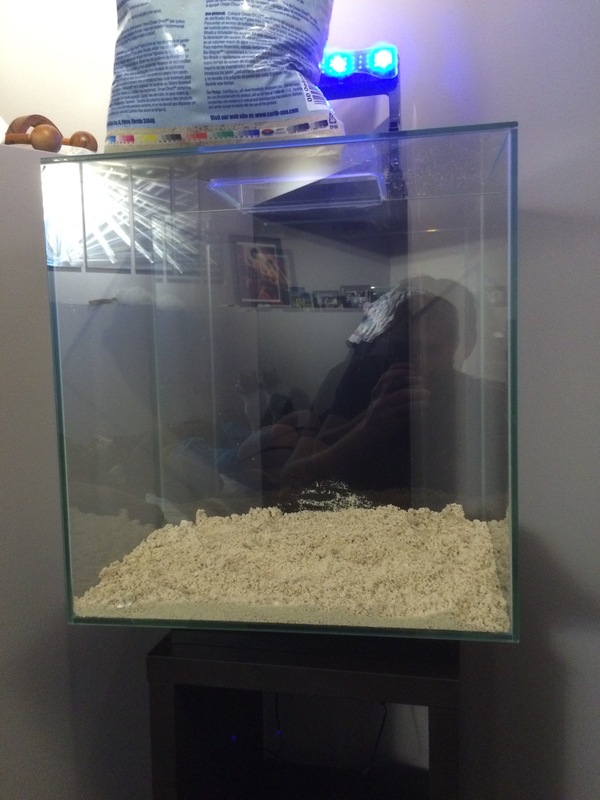 Something amazing finally happened… My tank has arrived!!!!!!!!!! Take me To Part two!!!!! 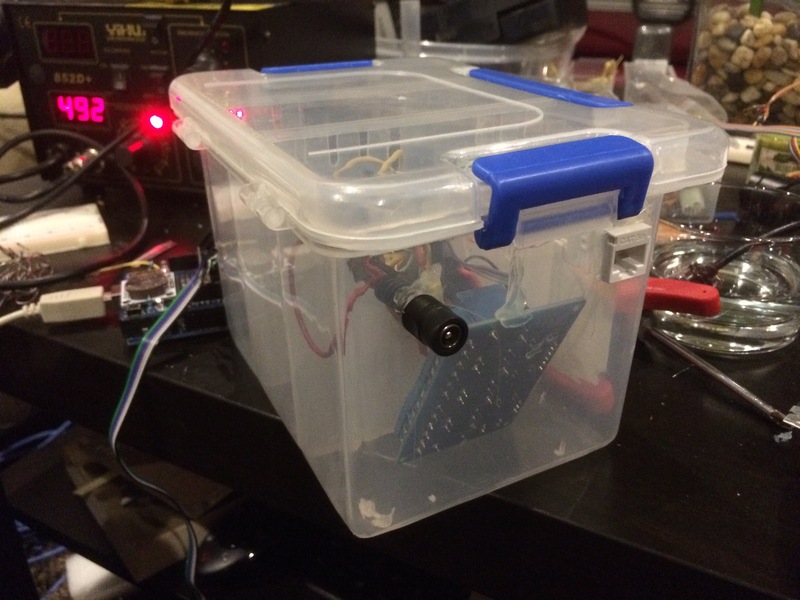 currently i’m working on building a wifi controllable/programmable sprinkler controller… and started thinking why not turn this into a tank controller! 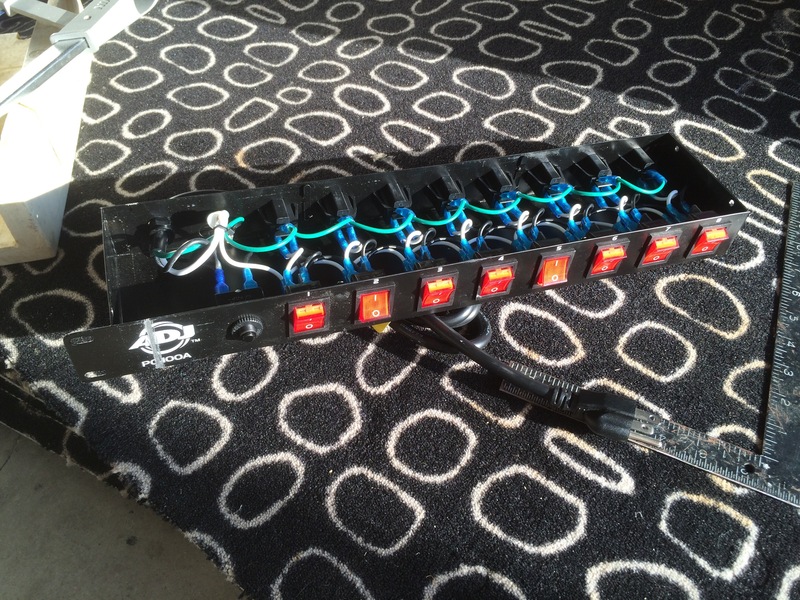 Once this project is done ill likely start my own version of a reef controller. 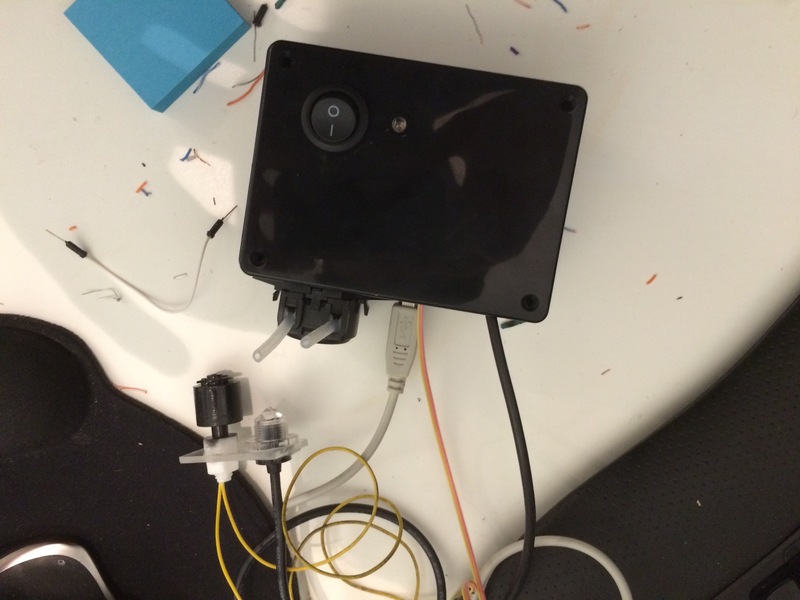 I’m on the fence on using arduino or raspberryPi.. but im sure it will be one of the two..
Stay tuned for more awesome projects and check out the quick demo below. 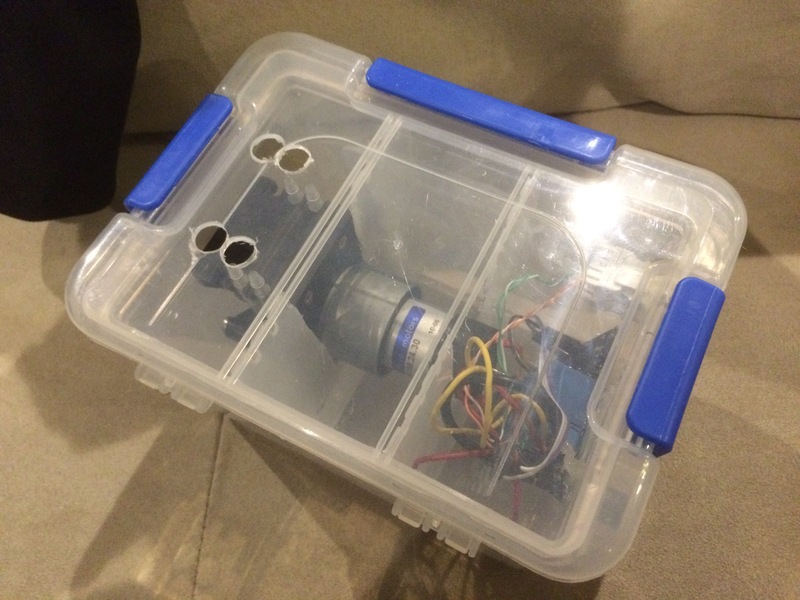 So I found an excellent project based fully with arduino by doughboy. rather than reinventing the wheel i will be using his project as a bse to build off of.. the origional project can be found here. 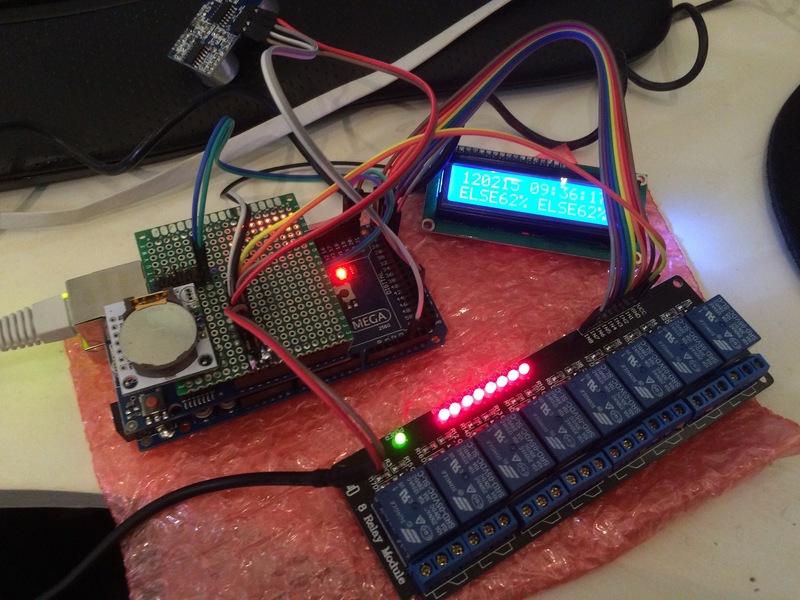 I started building my arduino based controller from the same project. 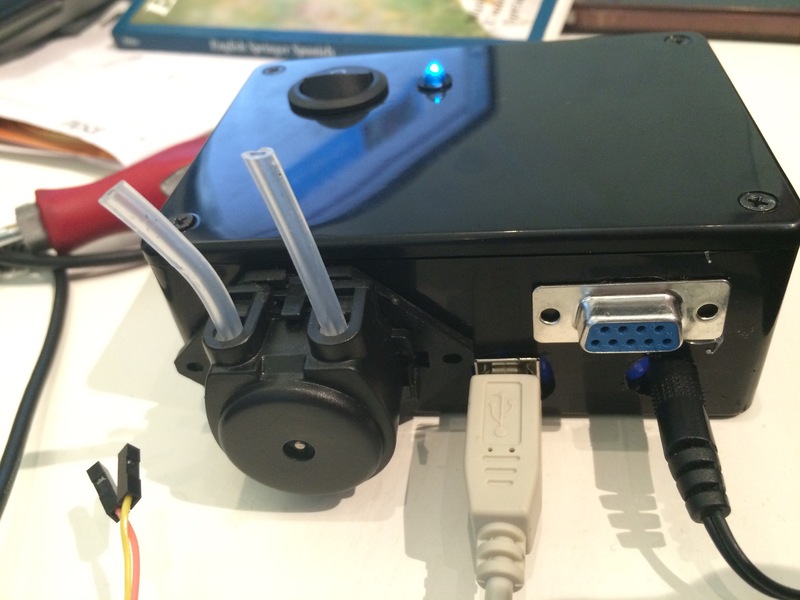 Uses a SR04 sonar sensor for ATO water level. 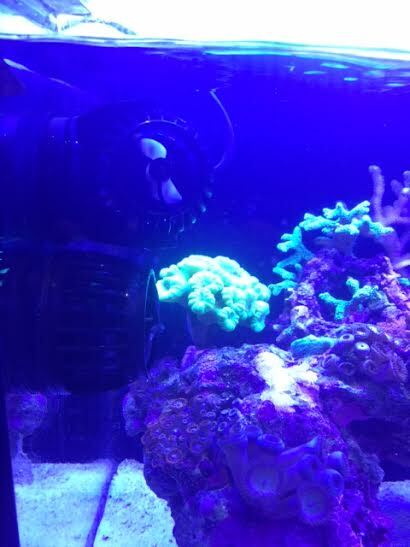 As you may know from my recent tank update, I now have 2 ecotech Radion XR15w Pros on my tank. I have had a number of requests for my lighting schedule so figured why not make a new post about it! 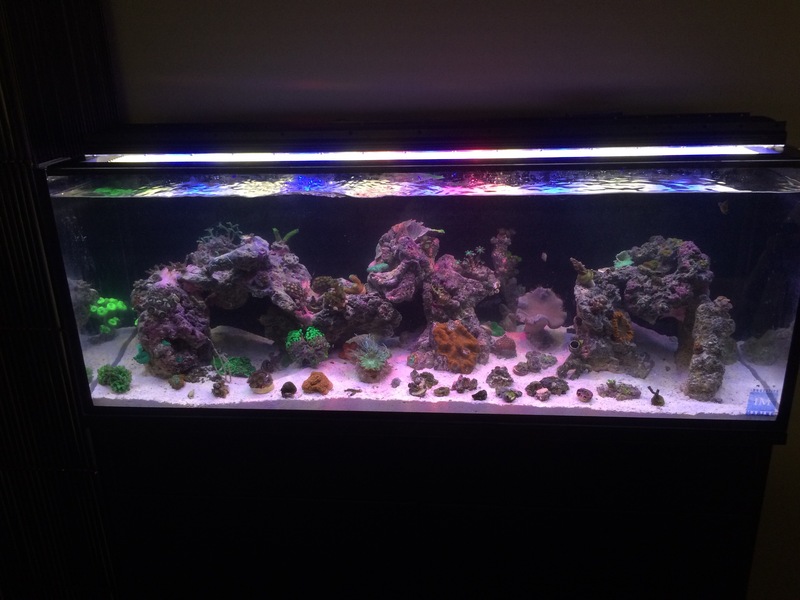 It can be a daunting task to know what to set your light at… to low and you are not getting the benefits.. to high and you risk bleaching your corals. 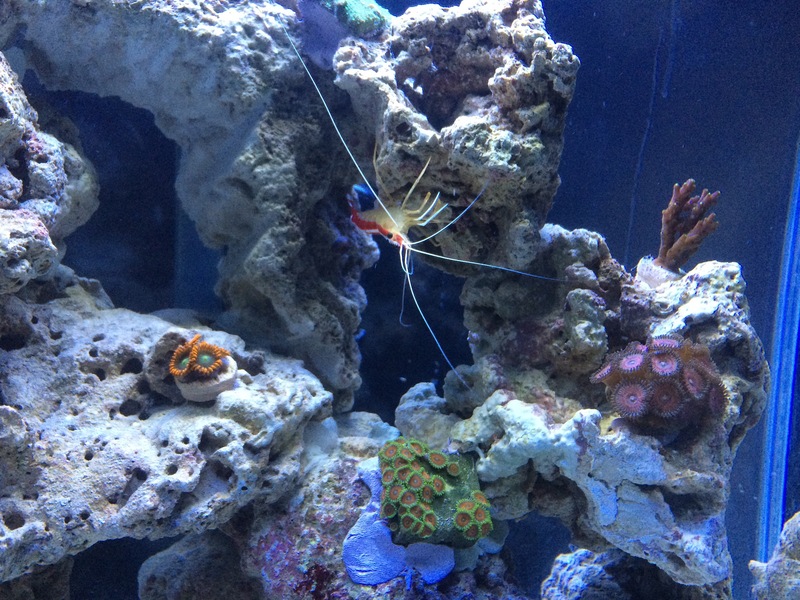 On my shallow reef (13″ deep) I set the radion to a max % of 45%. 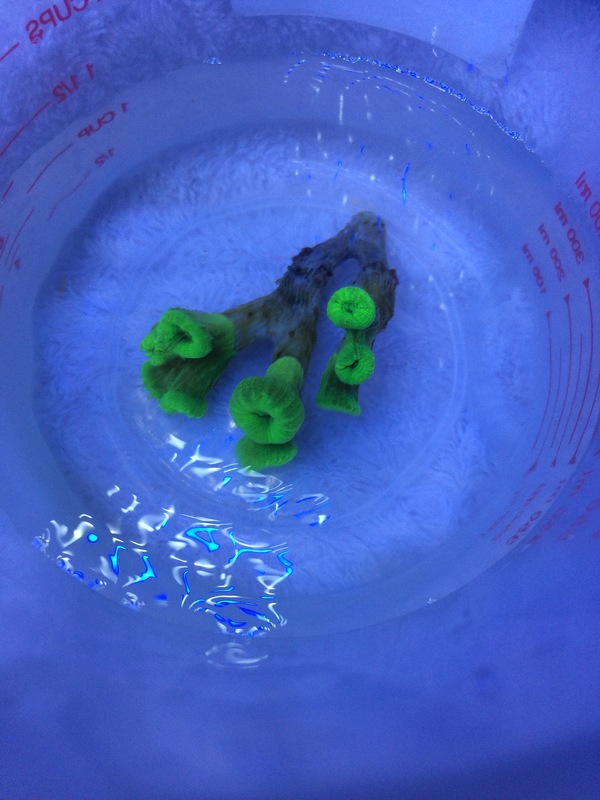 I also set a 4 week acclimation period which also starts at 50% (of my overall 45% intensity) this will ease corals into the new light. 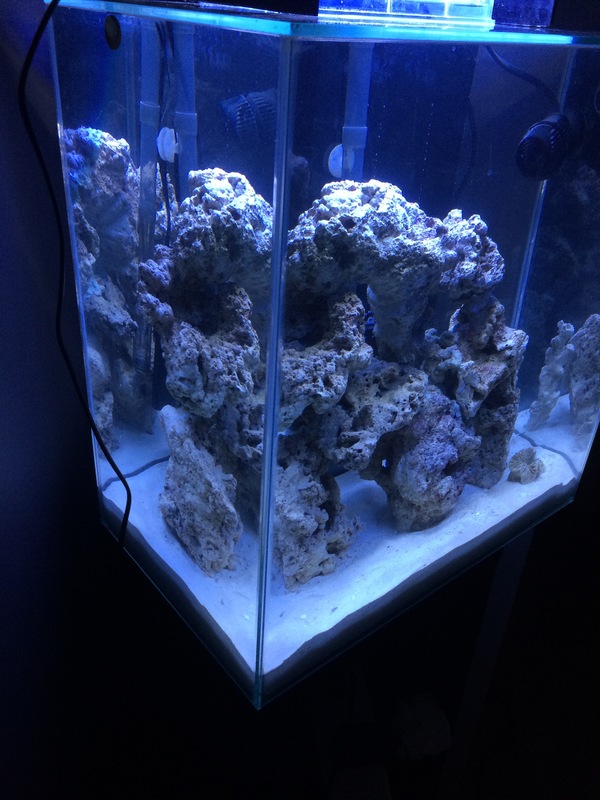 I had a 120w led fixutre over the tank previously so this likely isnt required in my case, however after spending a small fortune in corals i would rather be safe than sorry. Want the newst update? 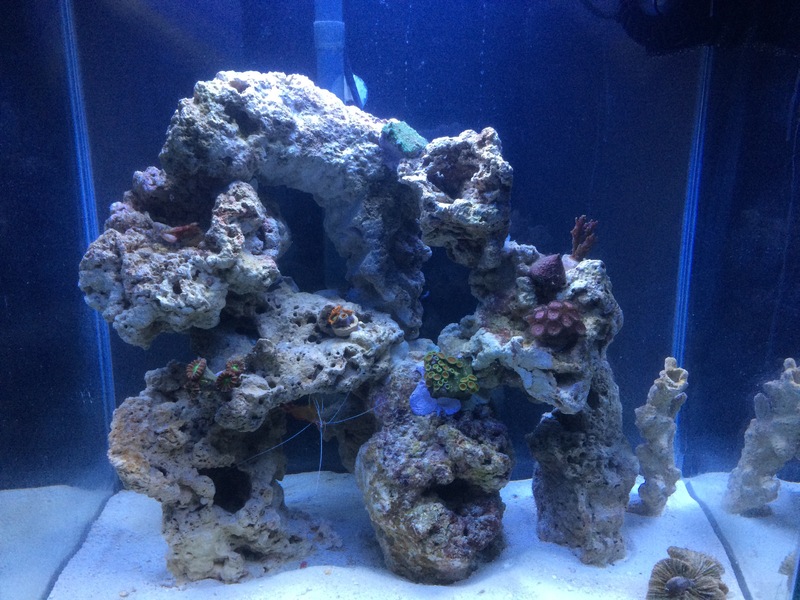 Check out the 5 Month reef update! Ecotech MP10’s and Jabeo RW-4’s are both great pumps and both have their pro’s and cons. 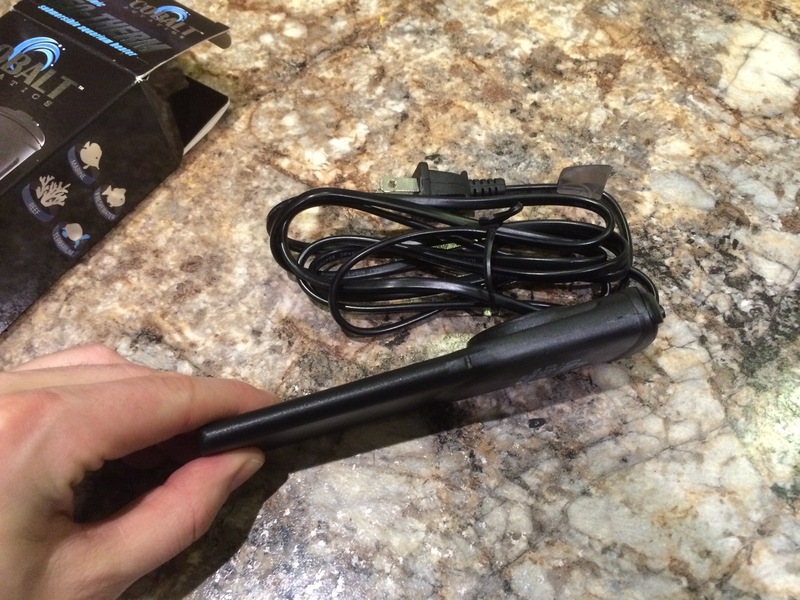 The Jabeo RW-4 is very tiny compared to most powerheads and packs a big punch. 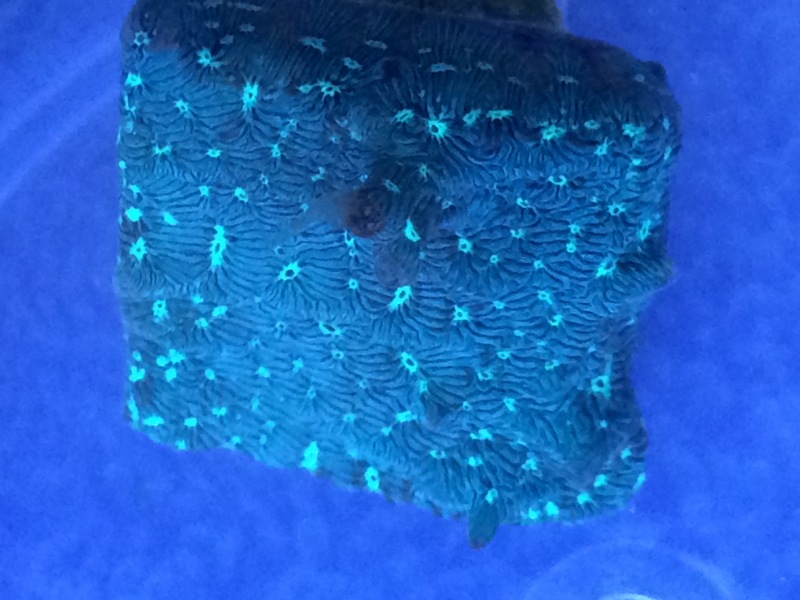 The entire powerhead resides in tank. 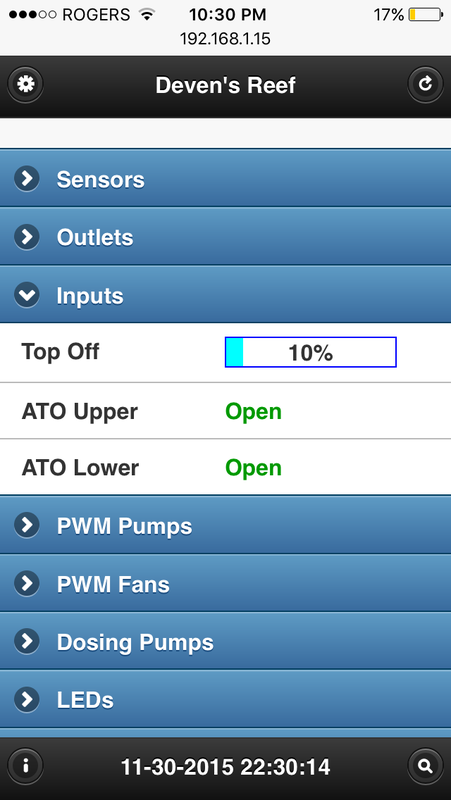 The controller has many options including wave modes, Else mode (random) and can wirless sync with another pump. you can control the time of the wave and the strength of the pulse. The only down full with the controller is it does not let you set a maximum level for else mode. 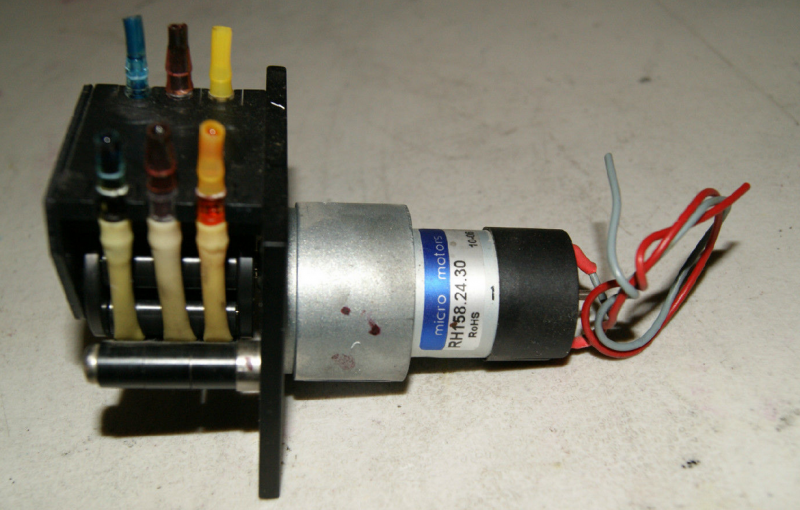 The MP10 uses magnets to spin the propeller and therefor the motor is outside the tank. Overall the unit is bigger than the RW-4, but the portion in tank is much smaller. The MP10 only points straight out where the rw-4 can be adjusted and pointed anywhere you like. One of my favorite modes is reef crest which is essentially equivalent to the RW-4 else mode with the added bonus of letting you set the maximum output. If you plan on pointing the RW-4 at the front glass rather than across the the tank, then row’s profile is much similar in size to the mp10s head. Now which one should you get? well that dends on how high rolling you feel, the mp10 costs about 3 times more than the RW-4. 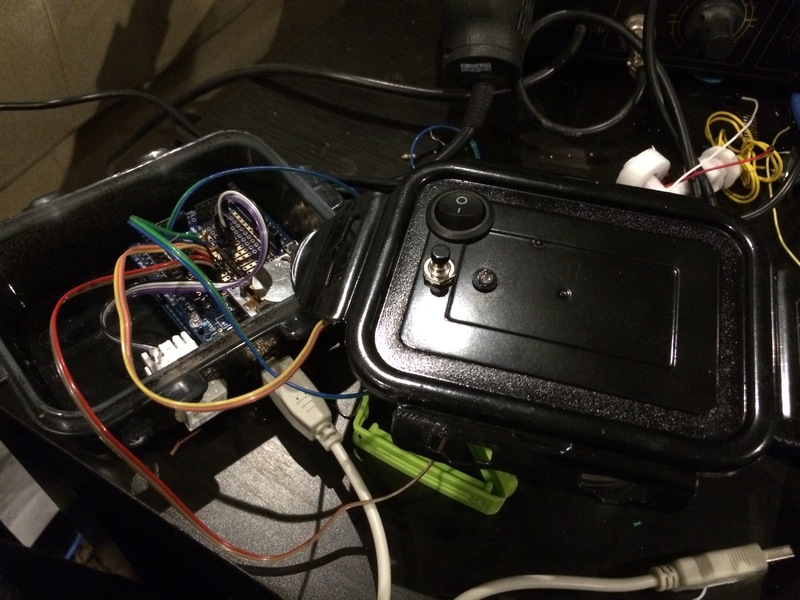 If you spend an extra $100 you can get a reeflink which is web interface/communication box to program your MP10 to do what ever modes when ever you want. Now its defiantly a nice toy if you have money to burn and too lazy to turn the dial one in a while. (keep in mind this only works with the MP10W versions). RF chips can be purchased after the fact if you ever decide to upgrade to the wireless version. 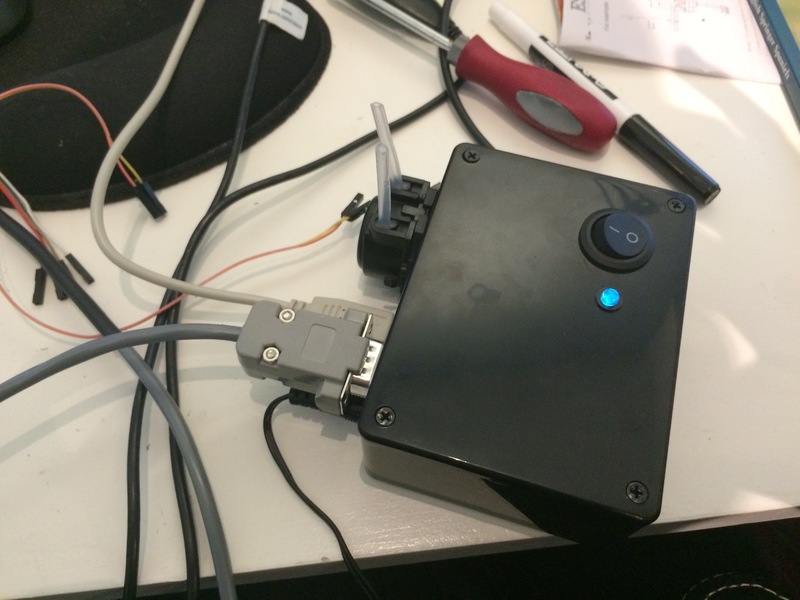 – Can wirelessly link 2 units. – Output can pivot and point to where you want it. I should be receiving a MP10QD in a week or two which is octets new quiet drive version. Ill post more pics and comparisons once i receive it! 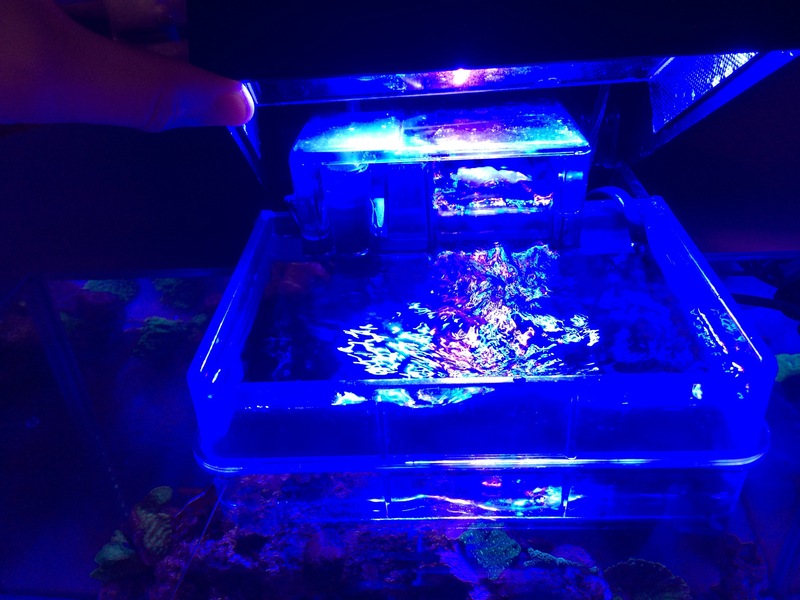 One of my favorite times to view tank is at night when the whites fade down and the blue/UV lights are on. 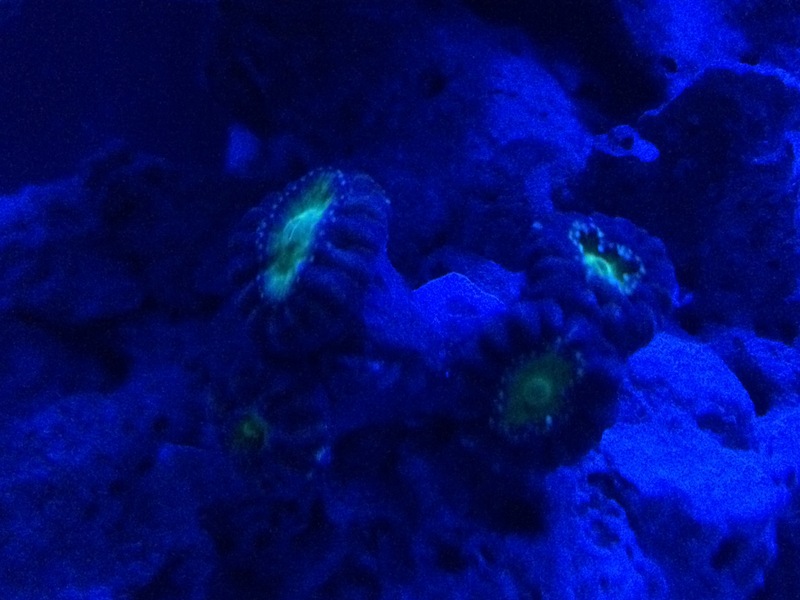 The corals have an amazing florescent glow and become extremely vibrant (who called for the black light party?!). I absolutely love it! 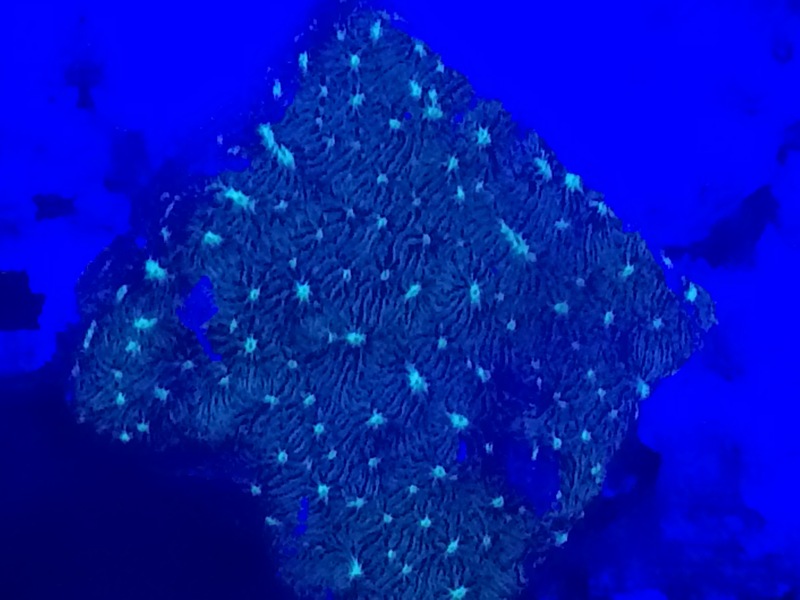 One of these days I will have to go on a UV night dive. 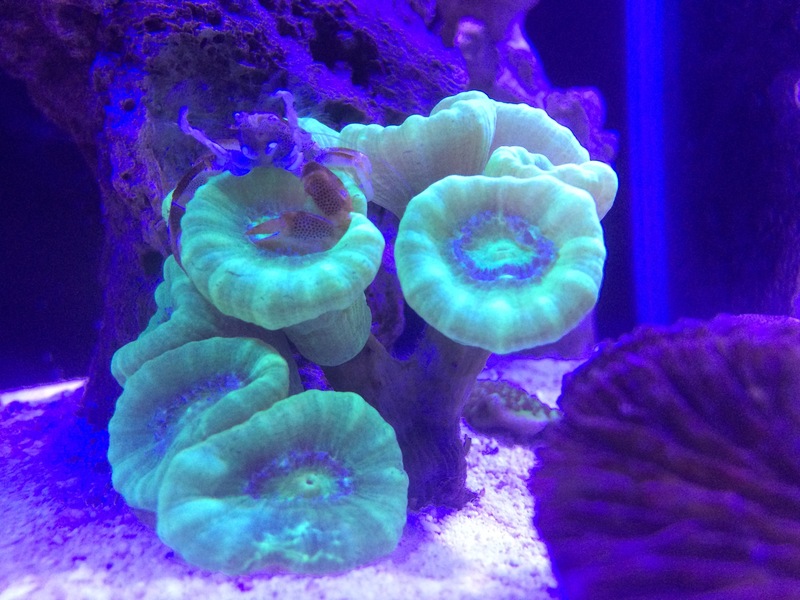 There are a few theories of why corals glow under UV, the first being a layer that act as a sunblock protecting the zooxanthalle within the coral. The other theory is that the colors are used the ward off predators (after all most vibrant colored animals are poisonous right?) 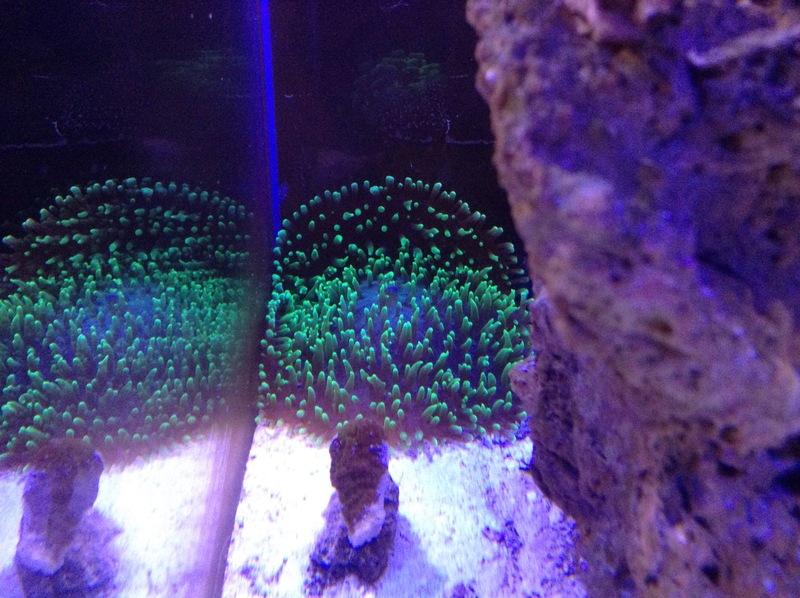 Either way it makes for an amazing aquatic display!. 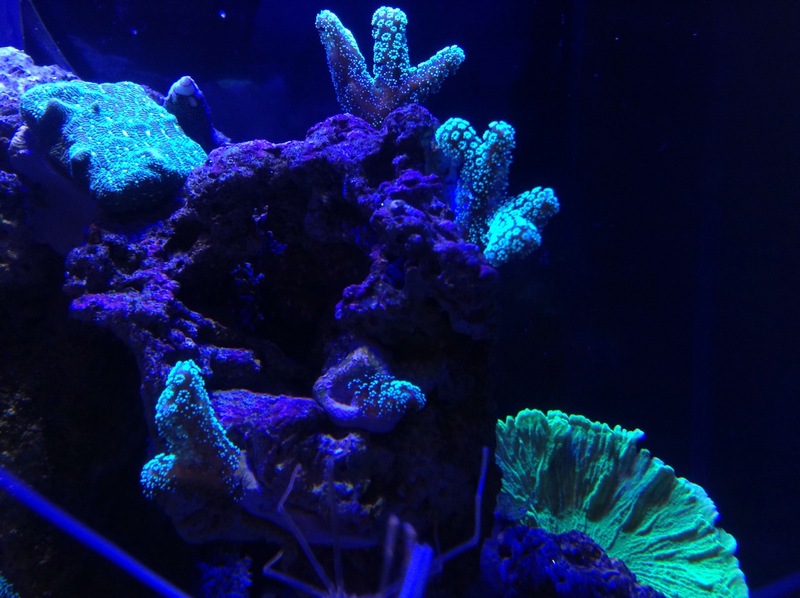 Here is a quick cell phone video of my Nuvo 30L tank under the blue lights. 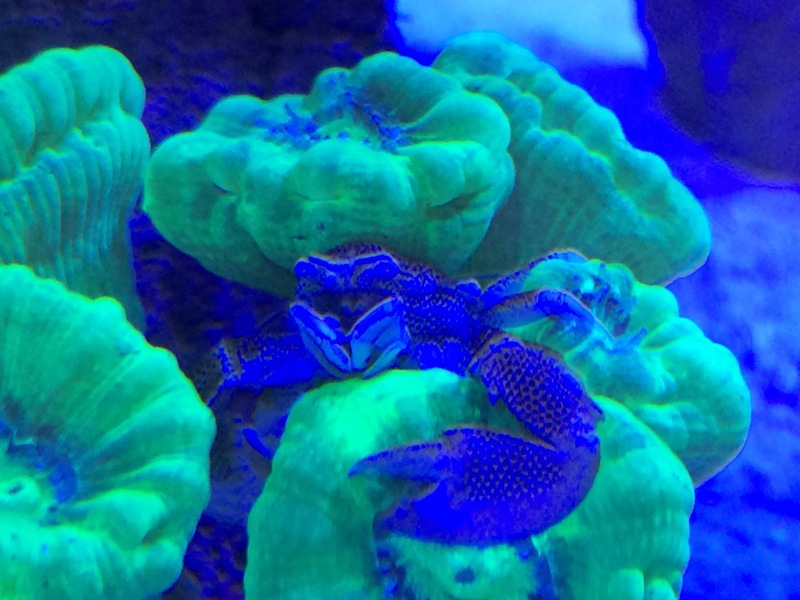 If you are into saltwater aquariums then there is a good chance you are into scuba diving and exploring that giant tank mother earth seems to house. For those of you who don’t know, the Galapagos is one of the most diverse places for wildlife in the world. Almost every species on the island has evolved to fit the islands and exist no where else in the world. This is where Charles Darwin’s theory of evaluation was born. This spring i was lucky enough to go to Ecuador and visit the Galapagos islands and do two amazing dives. I finally got around to editing a short video of some clips from our trip. 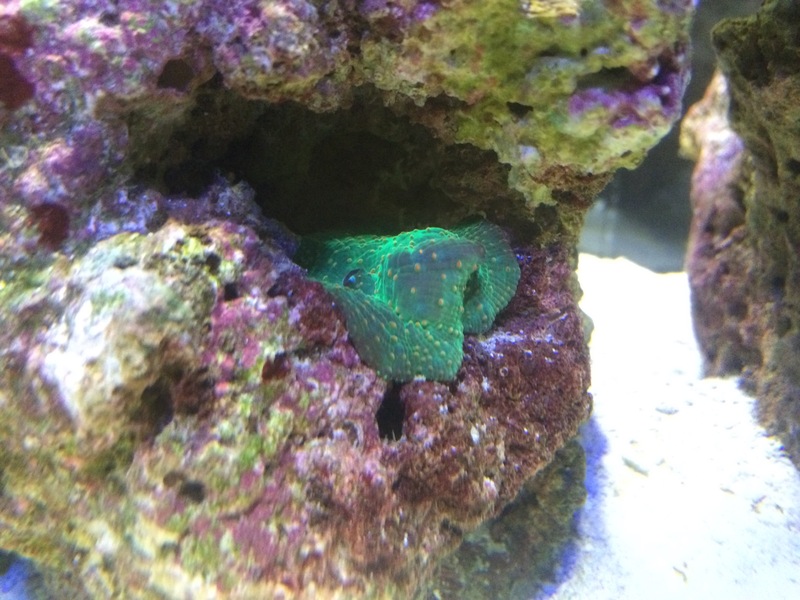 We saw countless fish, moray and garden eels, sting rays, eagle rays, white tip, back tip and hammer head sharks, sea turtles and so much more. I even snuck in a shark selfie! I hope you enjoy the video of my little excursion! 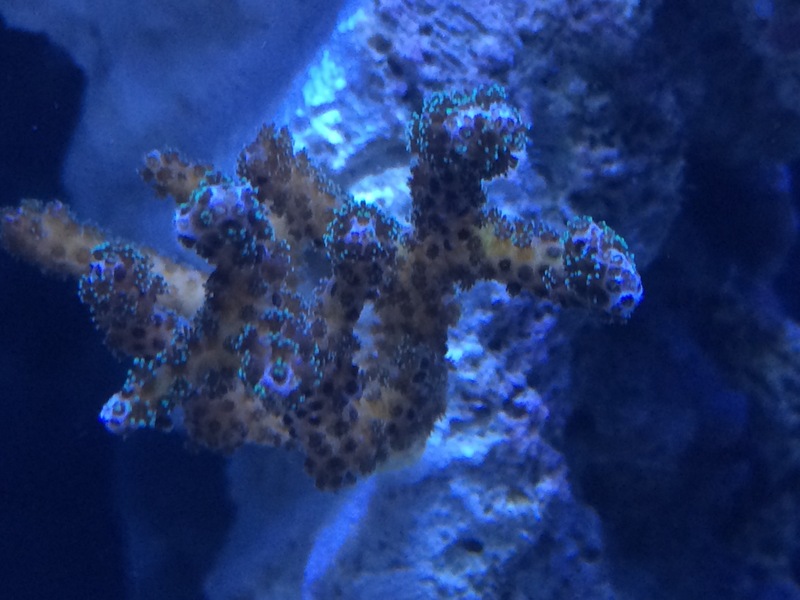 Things in the tank are finally setteling down and starting to look healthy. 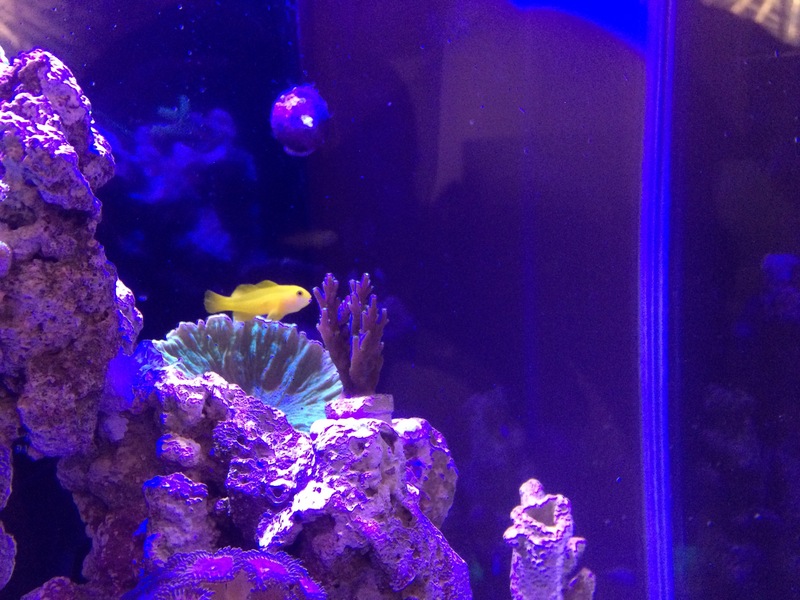 I have add a yellow watchman goby , blue line clearner wrrasp and a few new corals. 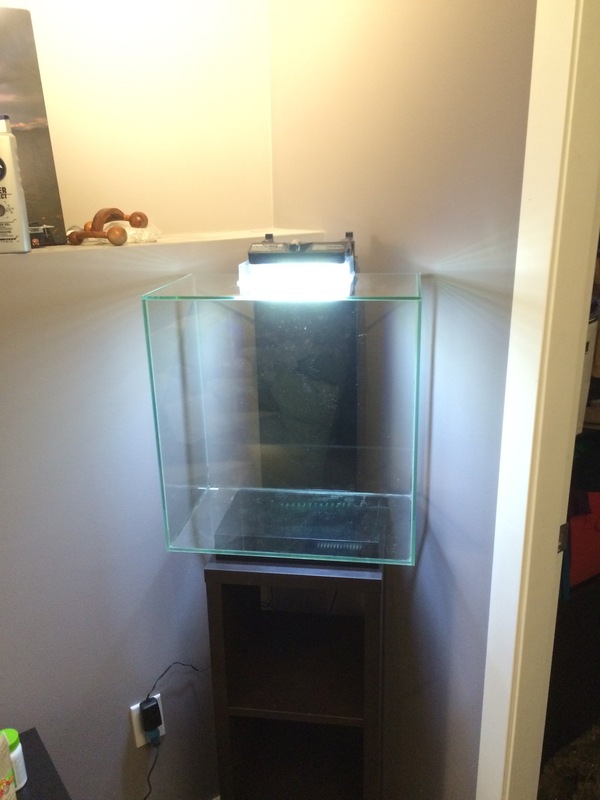 The tank has now been up and running for about 3 weeks so time for an update!. 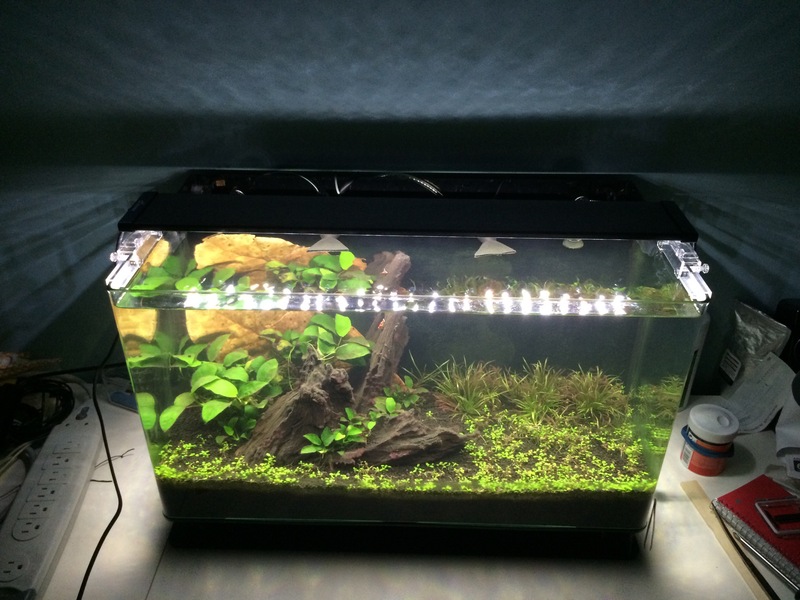 Next page > IM Fusion 30L 9 week update. The 30l is a very sleak looking all in one. 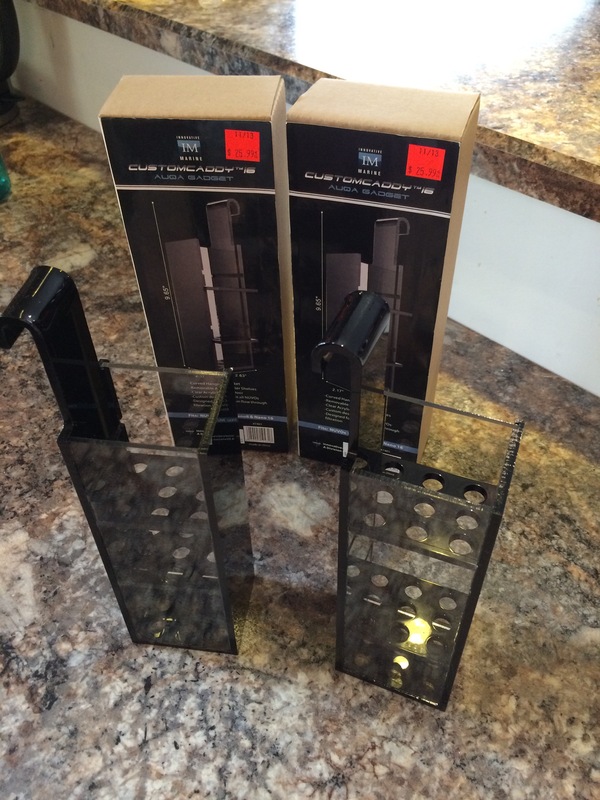 The glass is Much thicker than the nuvo24 and is is very high in clarity (low iron). I splurged for the stand as well which wasn’t cheap.. 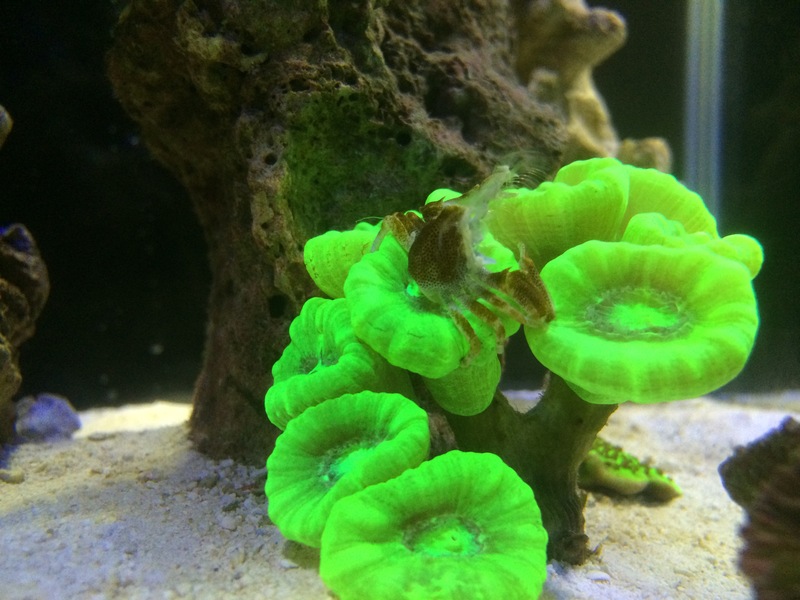 But matches the tank perfectly. And level the stand. Luckily it was perfect right off the bat! 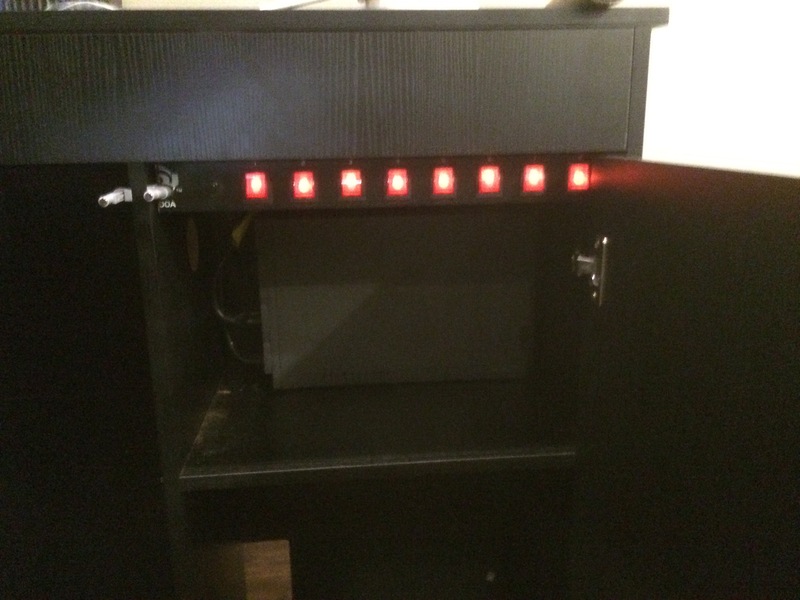 This take is in my living room and mode of a show piece… I wanted it pretty inside and out so I added a wall board to mount my controllers and hide the wires, plugs and UPS. The end result worked out great! 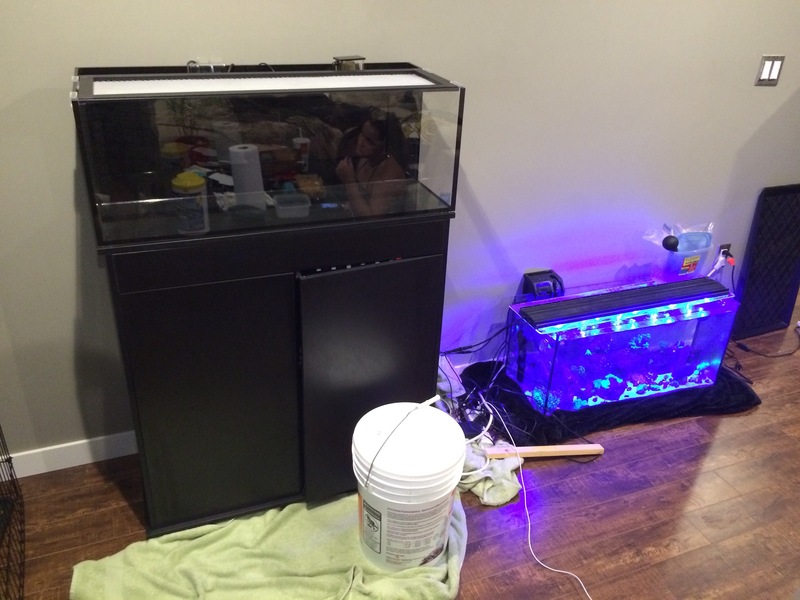 With the stand level and my master power center setup it was time to start transferring the goods the temporary tank to their new home. 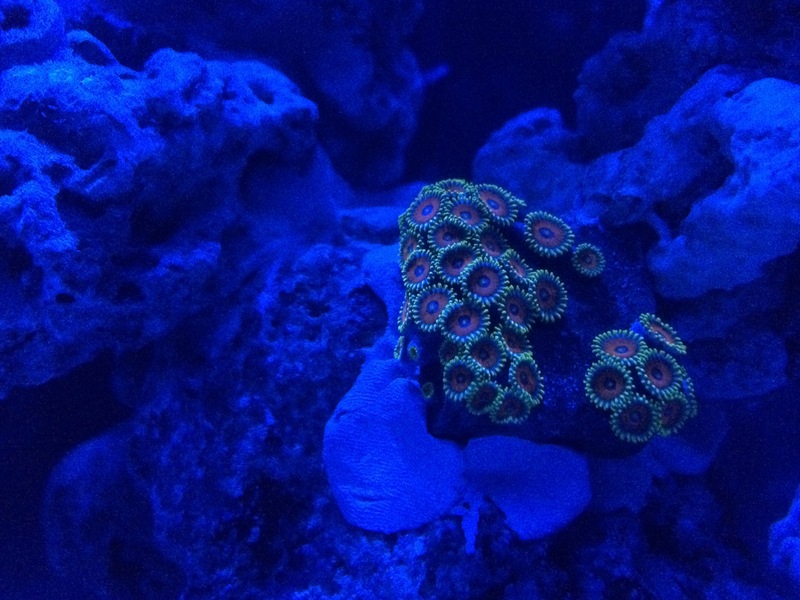 Let’s just say the rock was cooperating and I was up until 2am arranging it until I found something I liked. 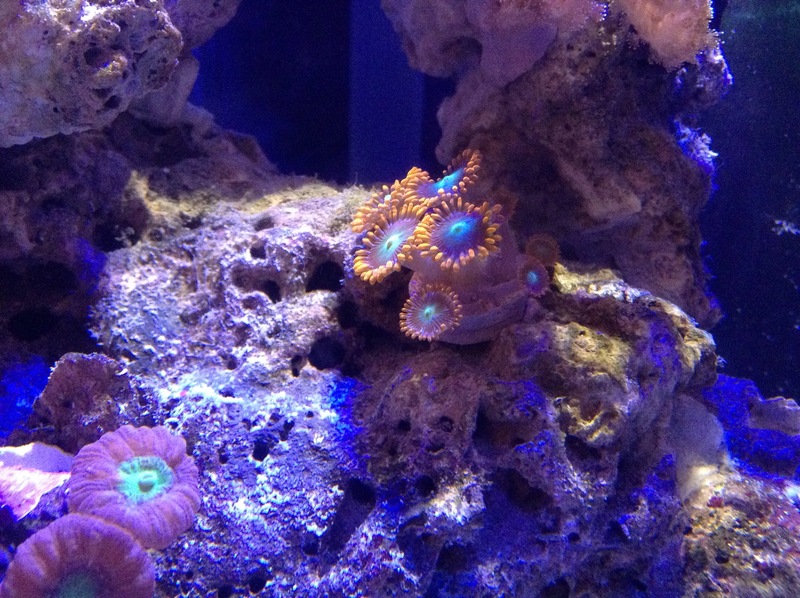 I still need to place all the sand bed corals, slowly but surely. 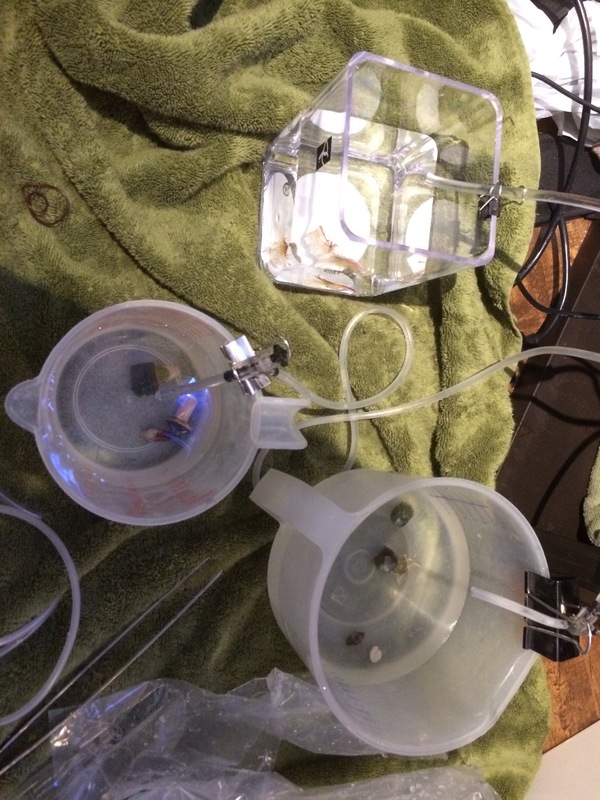 For filtration I’m using chemo pure blue, stock return pump connected to 2x soon steams. Click here to go to Part 2! 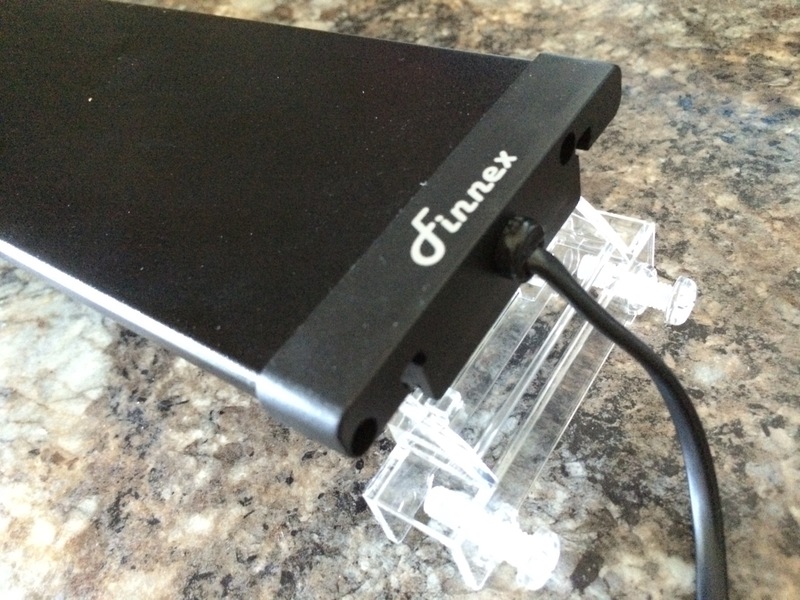 My Finnex Planed+ 24/7 just showed up in the mail so i figured i would do a quick unboxing and review. The light it self is very astetically pleasting. Is very thing and has a low profile. the cord is much longer on this model compared to previous finnex lights i have owned. 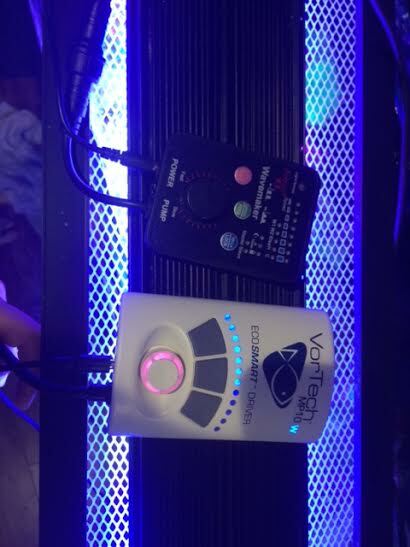 The light has 2 outer strips of 7000k white leds with a row of RGB leds down the center. 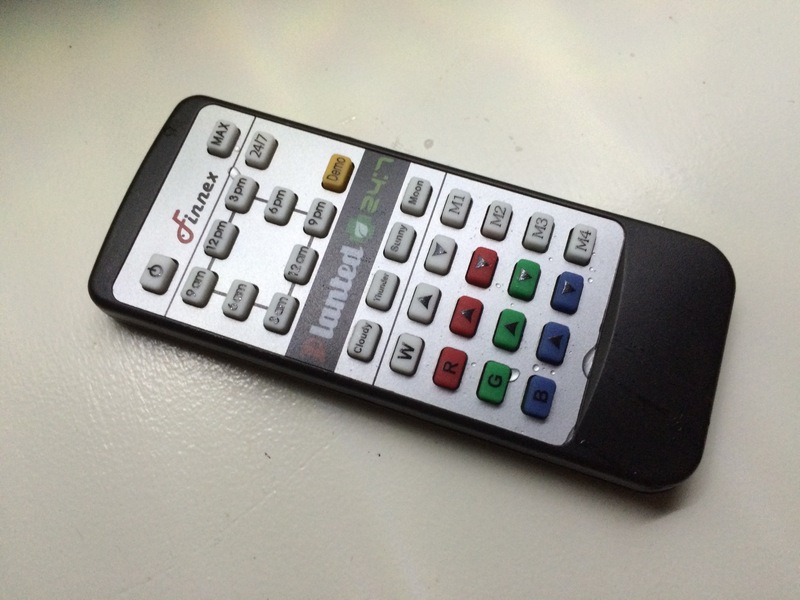 The remote lets you adjust the intensity of the white/red/green/blue.. which is nice to fine to to your desired hue. The light has a IR sensor wire out the side of the light with seems to be a bit of a waste and takes away from the sleekness of the light. 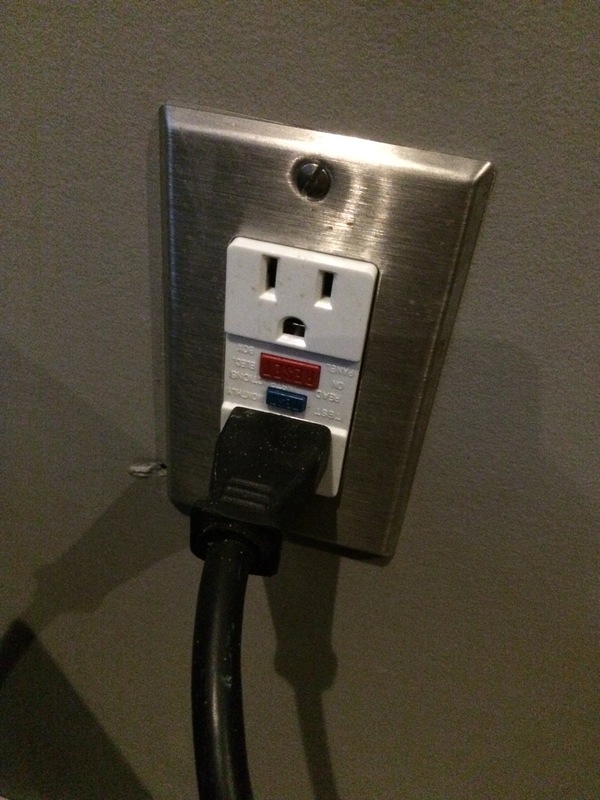 i would have preferred to have it built into the light or atleast to have the wires on the same side as the power wire rather than having to run wires on both sides of the light. 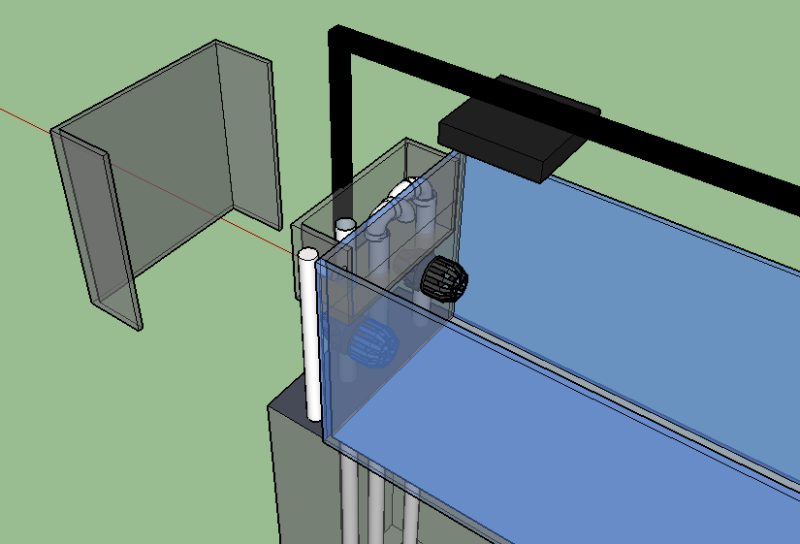 I’m currently in the process of designing a 6′ custom reef. today’s first attempt at a design. phytoplankton is one of the building blocks of life in the ocean. 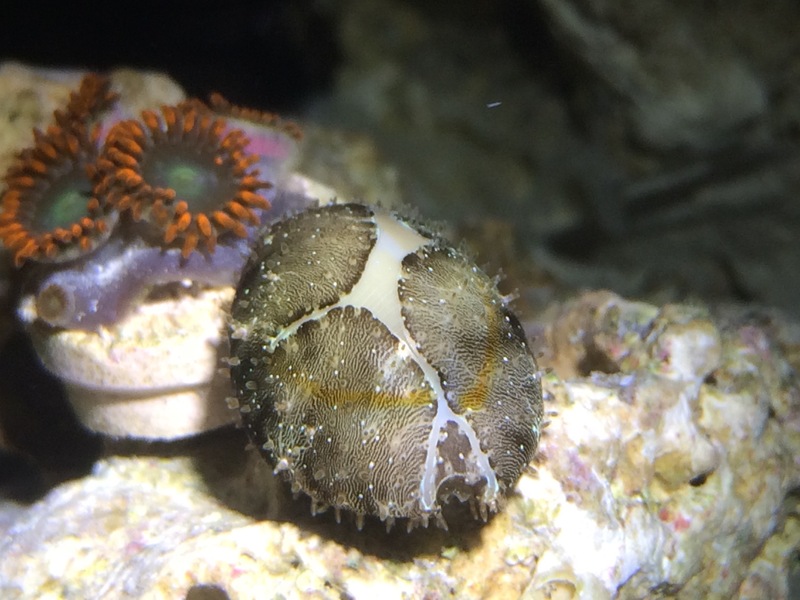 A little further up the food chain we get tk pods, Copepods, and rotofers. 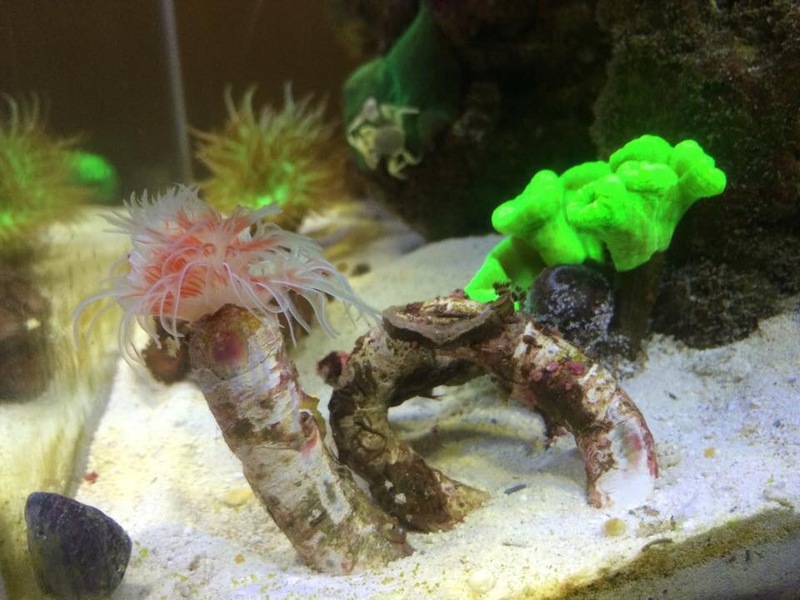 Adding this blend of goods will create a natural food source for your fish and corals. 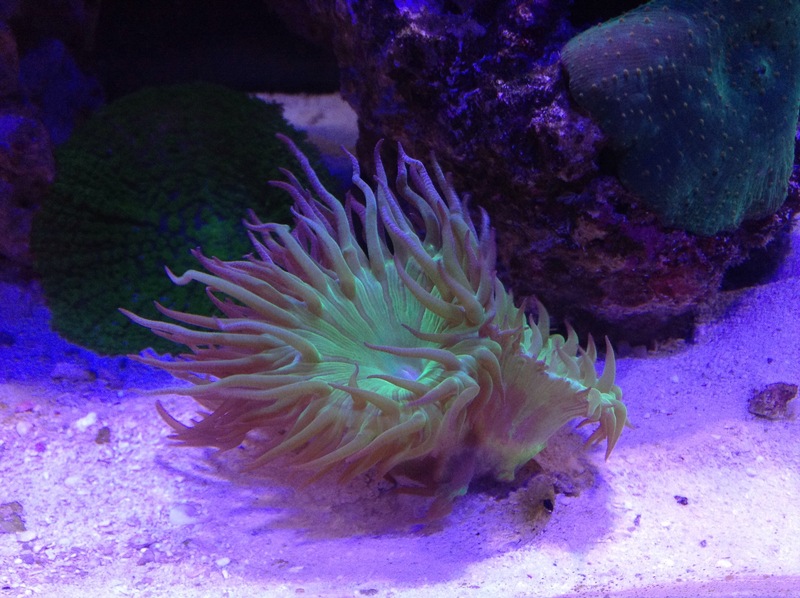 To initially load your tank its recommended to do it with the lights off and pumps off to give the miniature life forms a chance to hide and get settled. 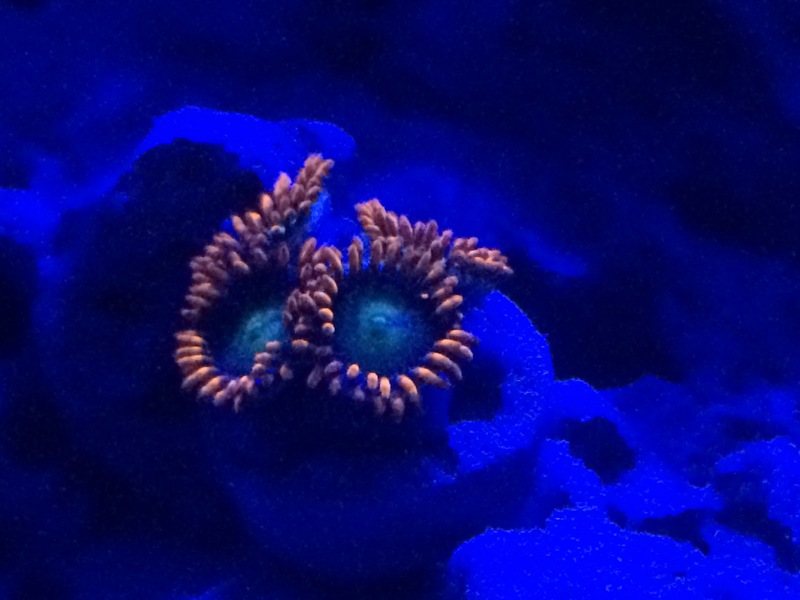 Once settled they should start to reproduce and provide a flow of snacks for your fish and corals. the stock media baskets that come with the innovative Marines are garbage. 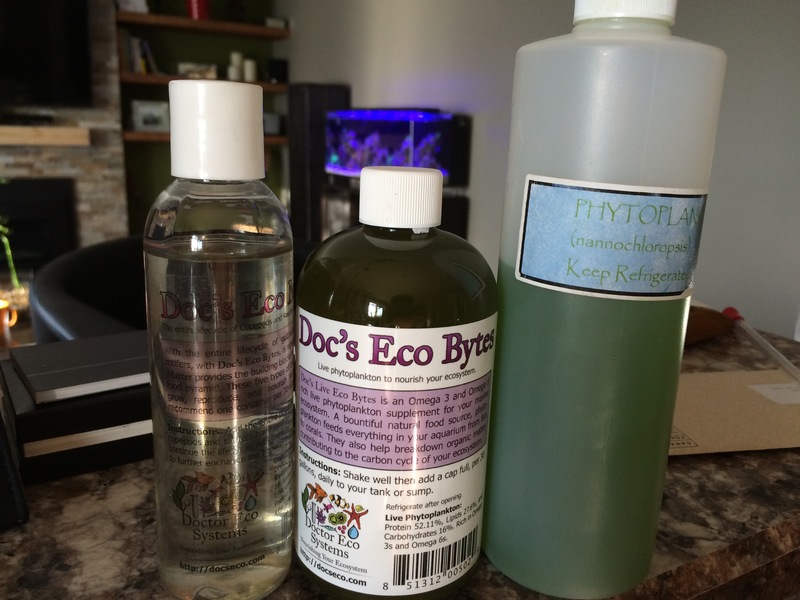 They “work” but are a huge pain in the but to open and close (you will fight it!!). 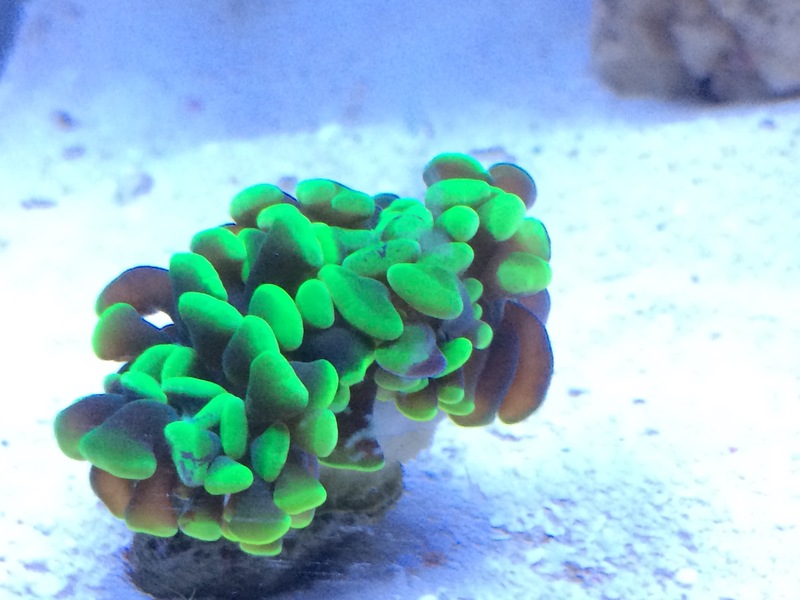 I bought some for my 24g salty tank and fell in love. They were a bit expensive for a media basket but the adjustability and ease of opening/cleaning is might and say compared to the dinky stock ones. 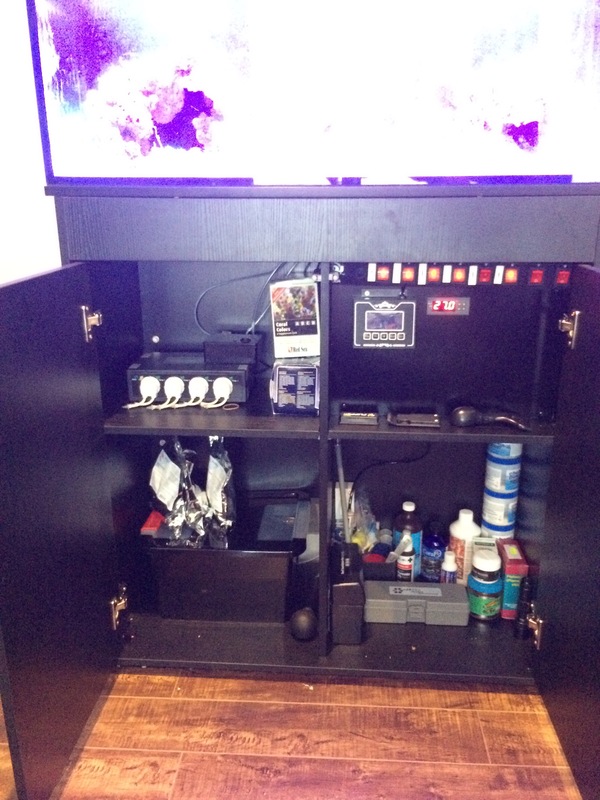 The other added bonus is the basket fill the full chamber and maximize your space for extra media. I was tired of using binder clips and clamps to hold my airline in place and hope nothing slides out… I though to my self.. there must be a better way? Why yes there is! 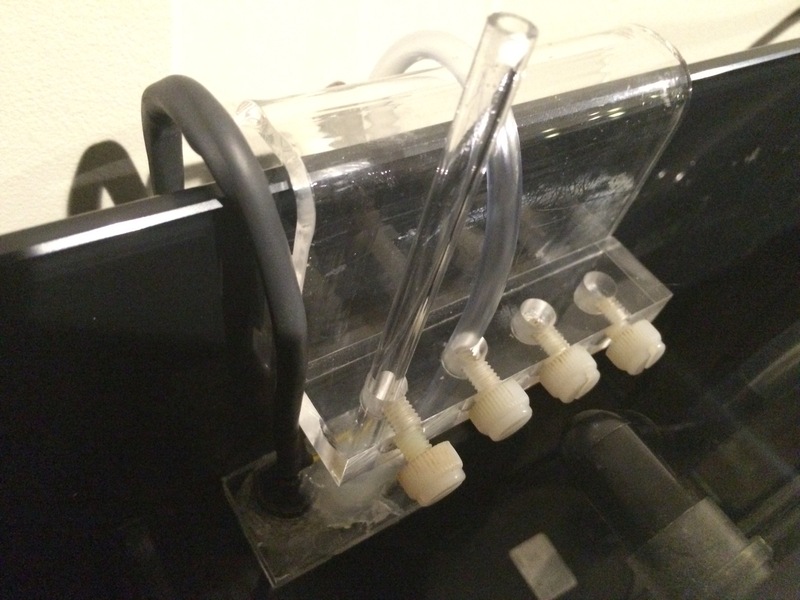 I made a rigid u shaped tube out of some left over acrylic pipe from mounting my DIY Osmolator sensors to securely hang over the edge of my tank. 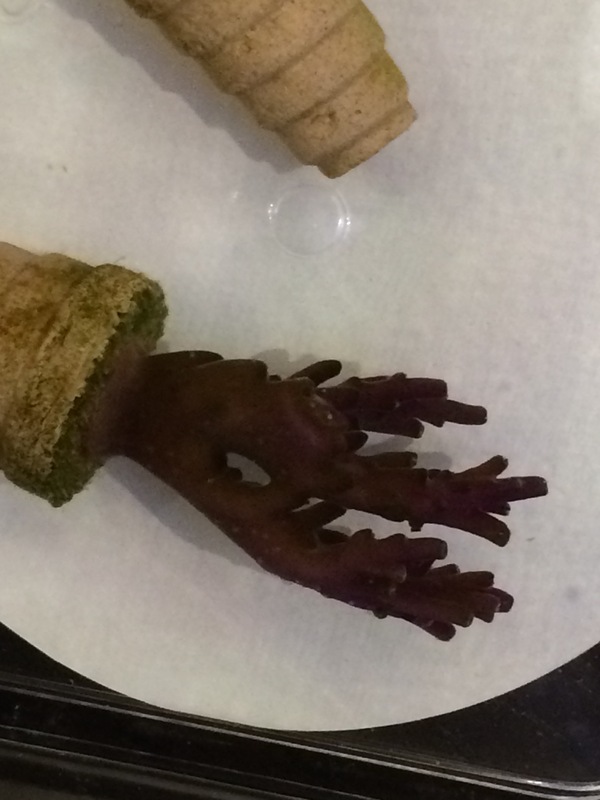 I used a heat gun to heat up the acrylic pipe and simply bend at the warm/soft area to the desired shape. Be sure to do this very slowly so dont kink the inner tube. 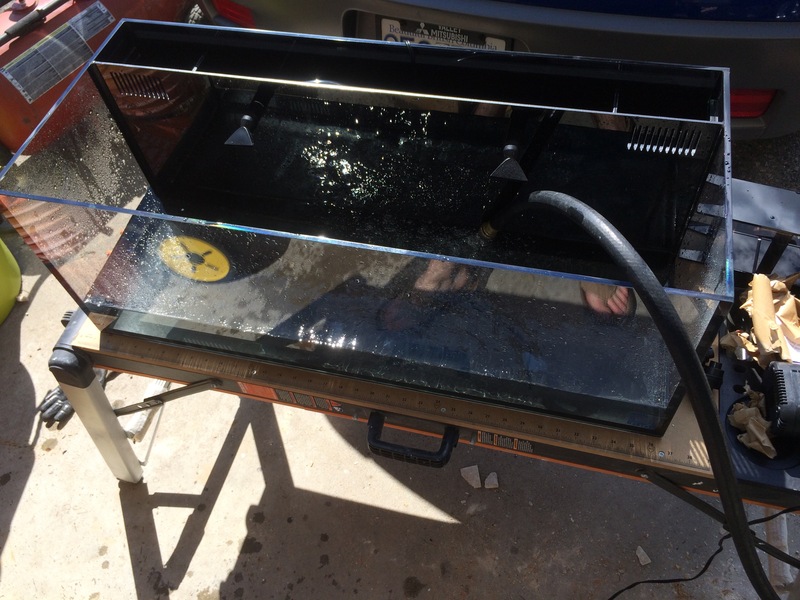 You will also want to keep moving the heat gun so you dont get bubbles in the rod from to much heat. For the adjuster i razord the edge of a airline valve to a point (took off the excess bulk) heated up the end of the acrylic tube and worked it in. I then superglued the fittings together to ensure there was no chance of a leak. Simply connect the airline from the bottom to your bucket and acclimate away! 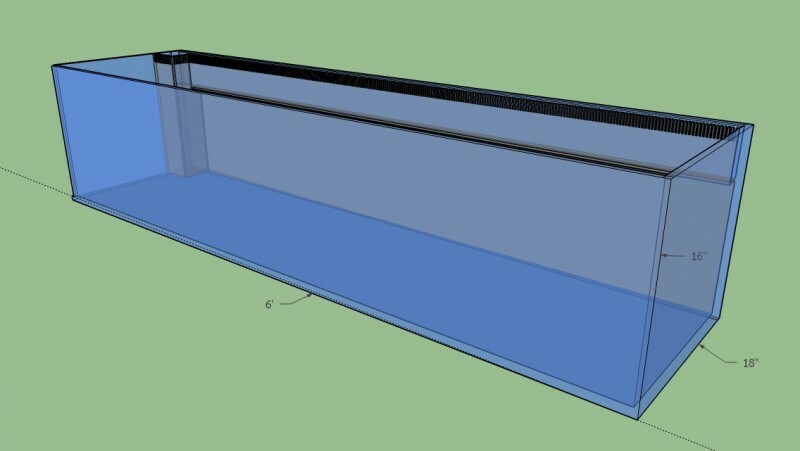 no more clips to fiddle width, scratch your glass or slide out of place! Simple and very effective. 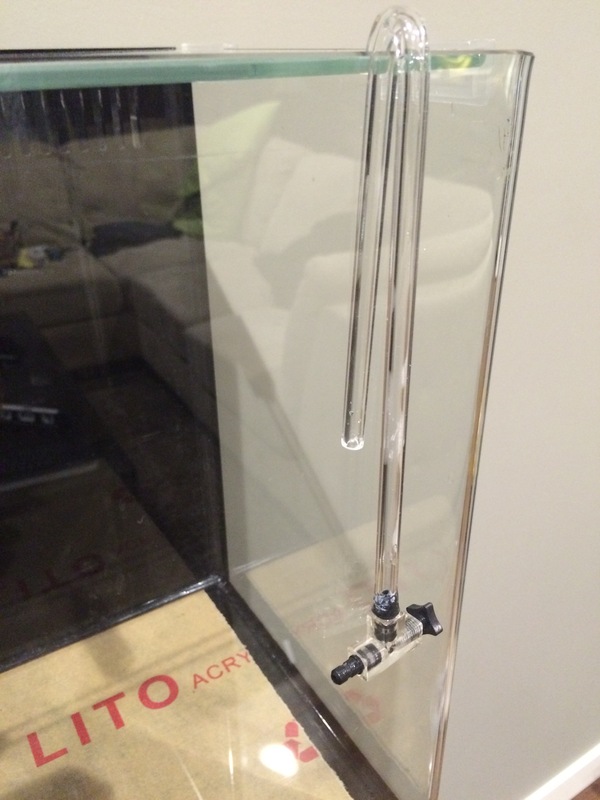 Evaporation and increased salinity levels is one of the fastest ways to crash your tank.. An ATO, auto top off or technically an osmolator will automatically add freshwater back in to your tank to keep the water level constant and compensate for evaporation. Since a fancy auto top off can cost 100-200$ I decided to make my own extremely accurate version for a fraction of the cost. 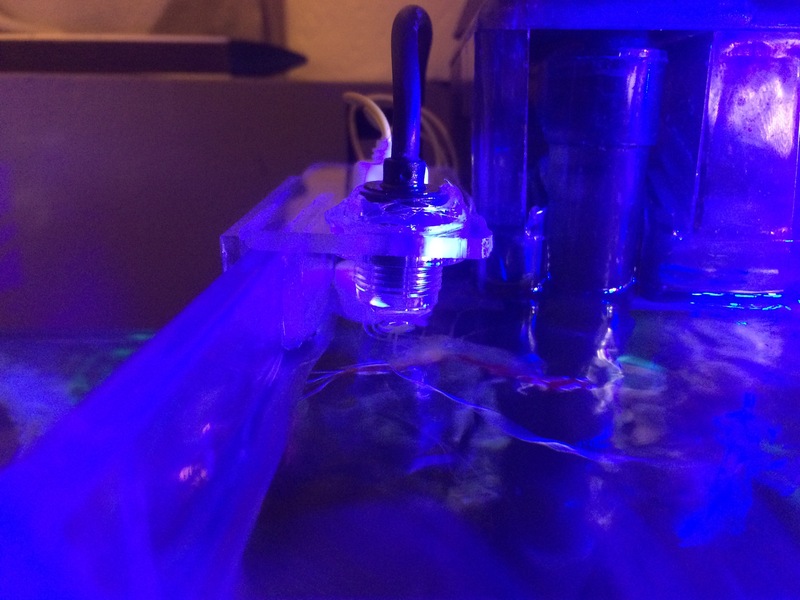 Rather than using just a standard float valve (which can fail) I went with an optical water level sensor, which is very accurate and detects when water touches the top of the sensor. 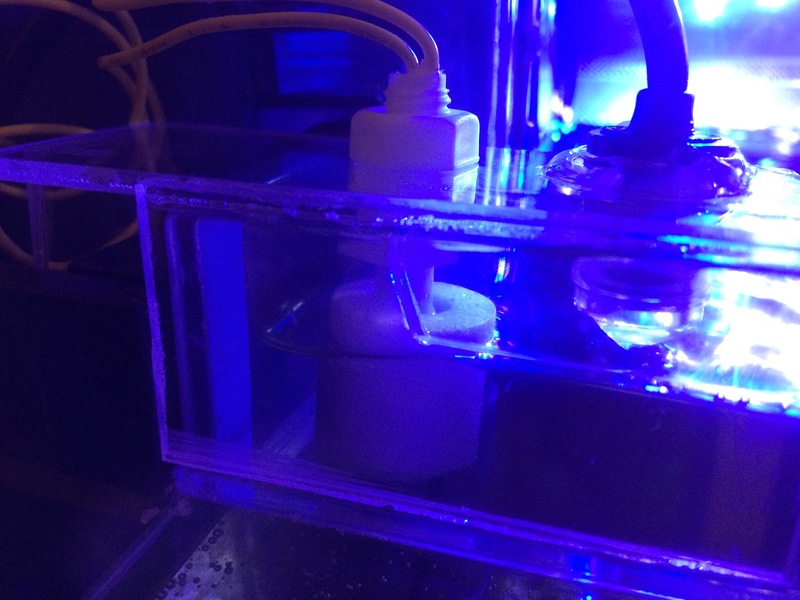 I also added a float valve as a backup. 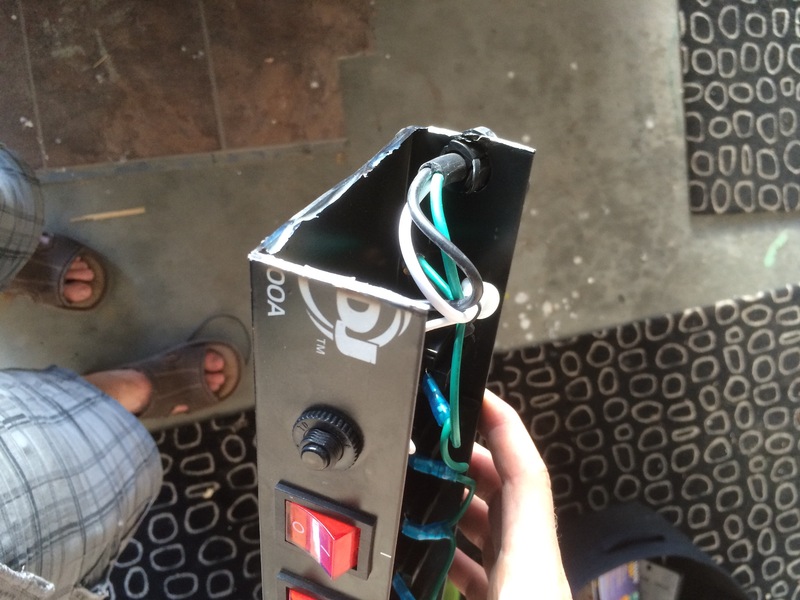 I also added a Hold switch to the box. 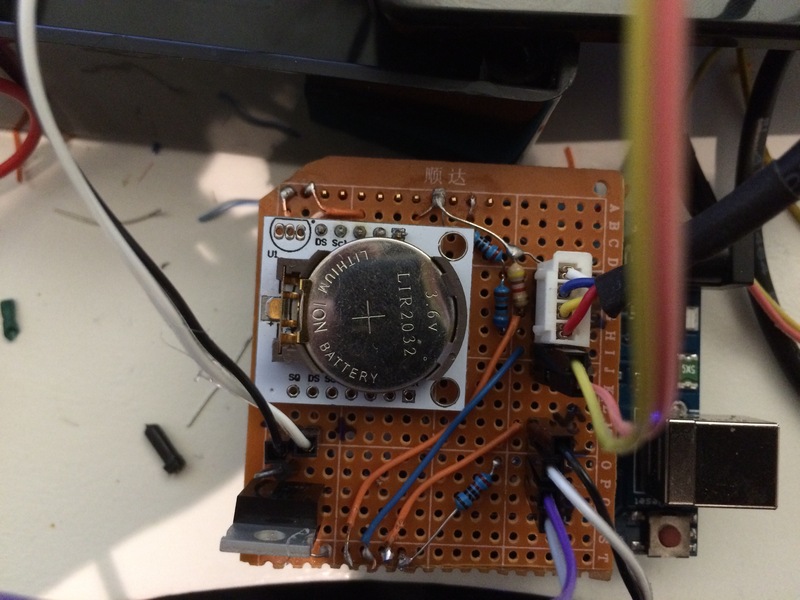 When this switch is hit the arduino goes into a loop of blinking the LED as a reminder to turn it back on. 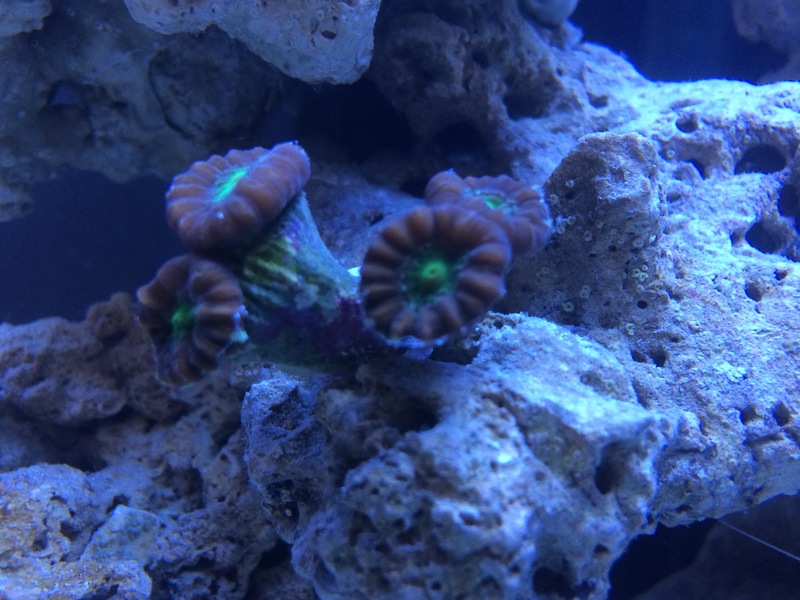 This Hold mode will be useful when doing water changes. I may add a third safety of only running the pumps for so many second per fill. But this is dependant on if I do micro topoffs 24h/day or hair have the ATO check every few hours or at times I’m not around. 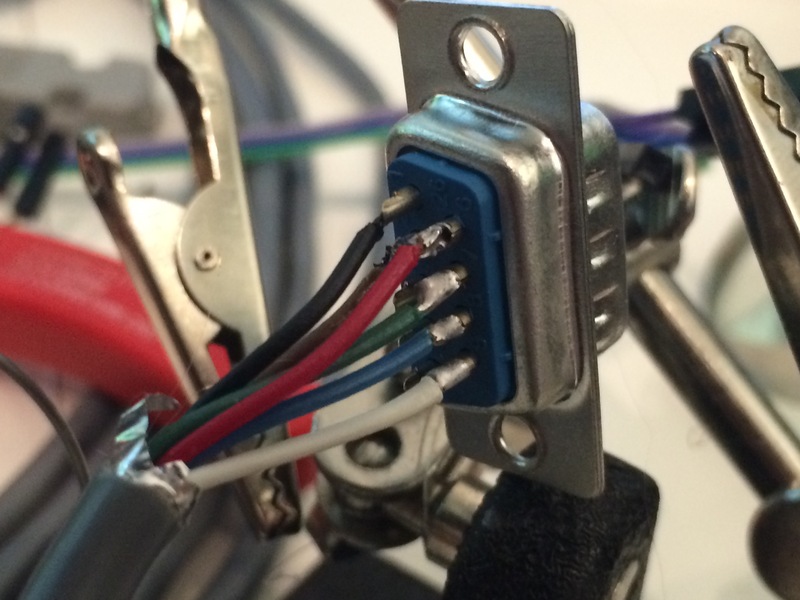 I need some form of a 6 pin connector but came up short and decided to go with a DB9 connector as they are cheap and readily available. 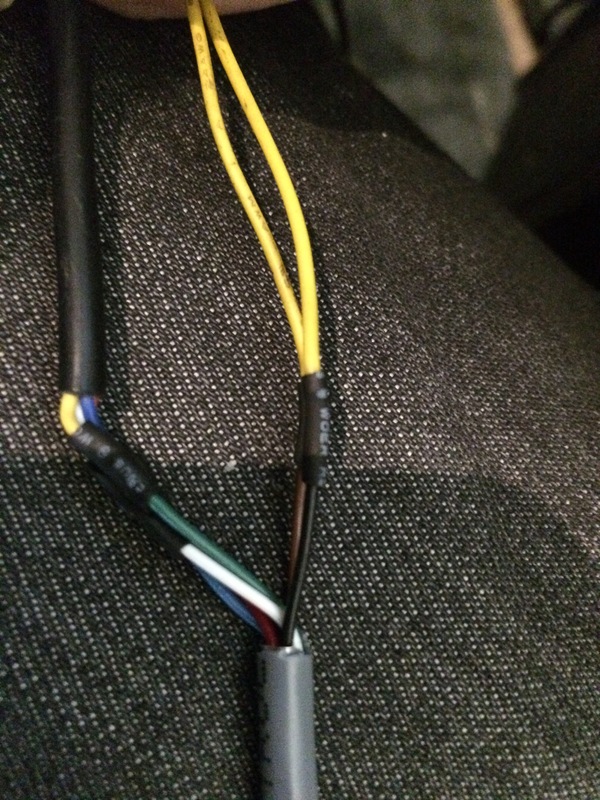 Once i soldered the sensors on to my wire i covered the last half of the wire all the way down to the sensors in heat shrink to seal it up and have a nice black wire to blend in with the back of the tank. Motor on the left, 12V power in the bottom right. DB9 connector for the sensors and USB in case i want to adjust the programming at a future date. I found a thin acrylic rube which was about the size of an airline. This allowed me to use an airline holder as my mount. 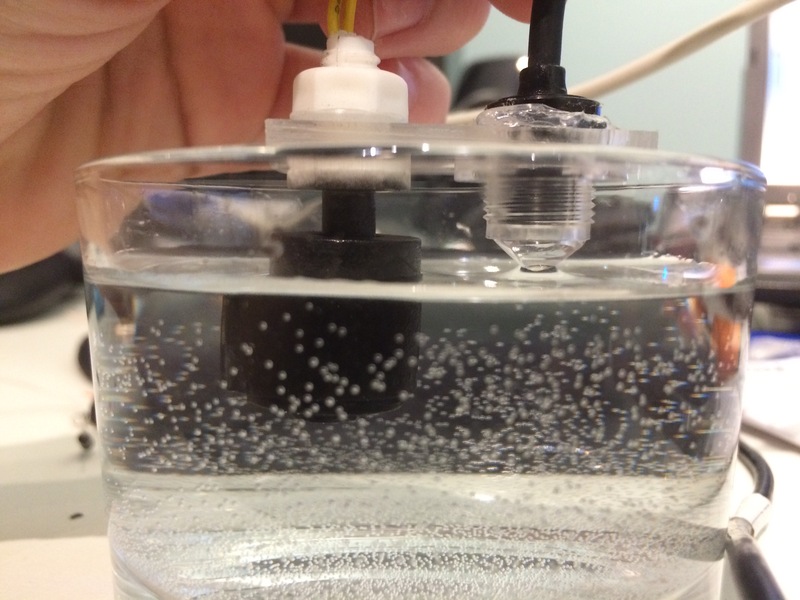 The beauty of this method is i can very easily raise and lower it to set my water level. 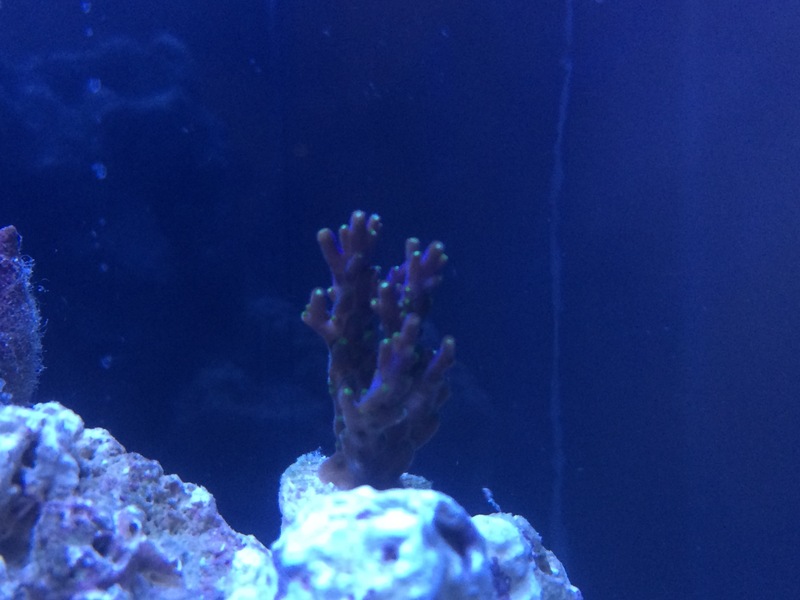 Once i fill the tank ill trim the rod to about the level of the tank. to clean things up. 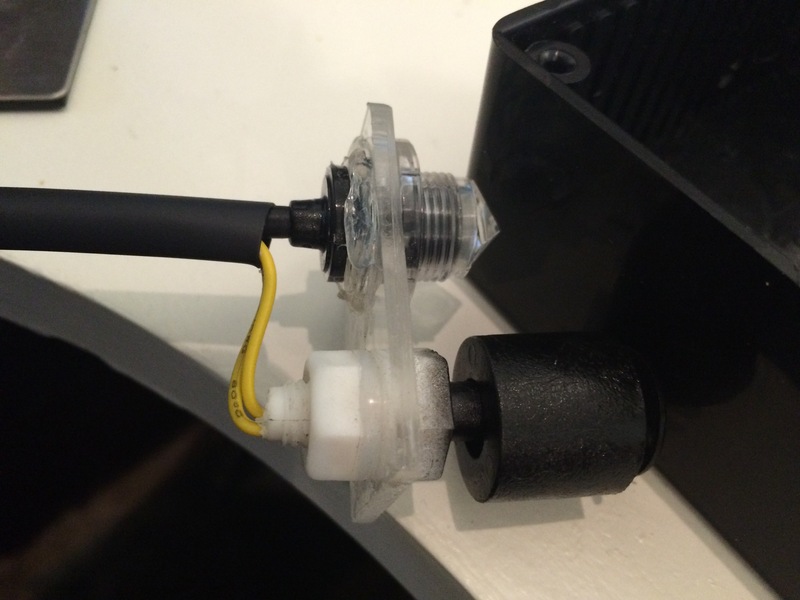 I do love the simplicity and adjust-ability of this method of mounting it. 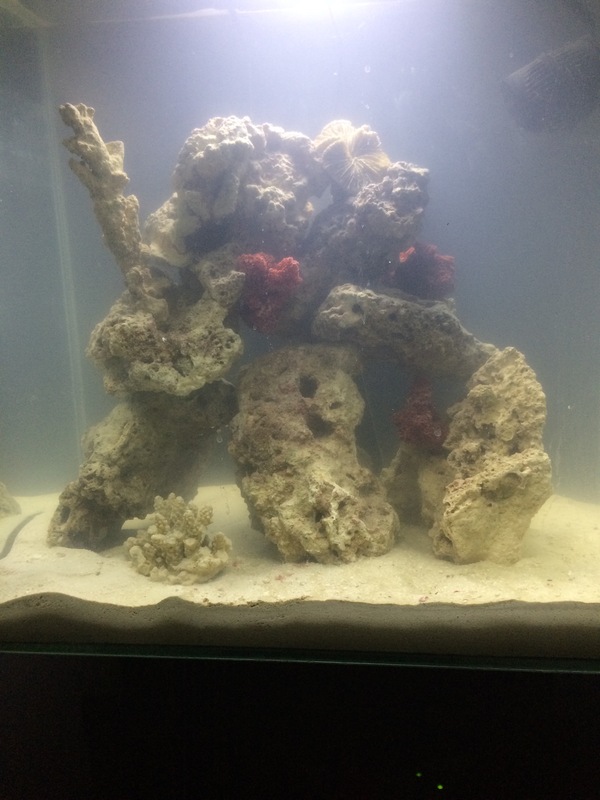 Water changes seems to be the hardest or most time consuming part of keeping an aquarium.. So why not automate it? 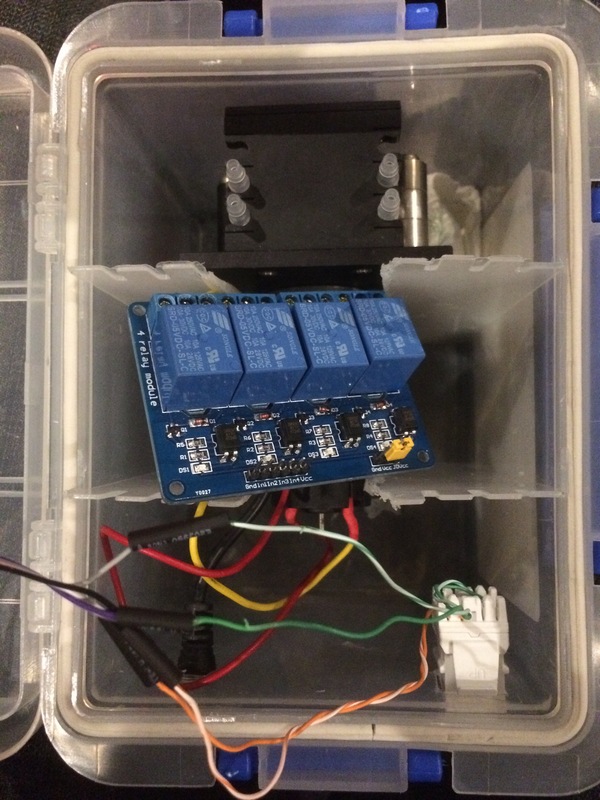 In a previous write up i build an automated dosing system i called the Arduino auto doser. 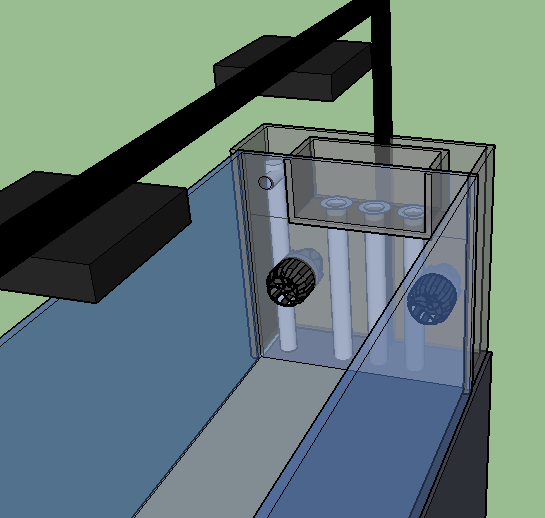 I plan on using the same concept to build an automated water change system with a bit of a twist. 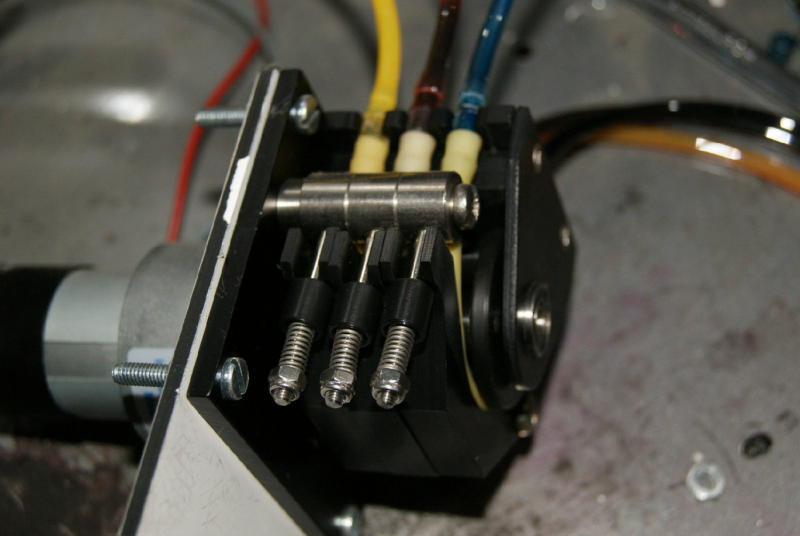 Most water changers simply drain water out than add water back in. 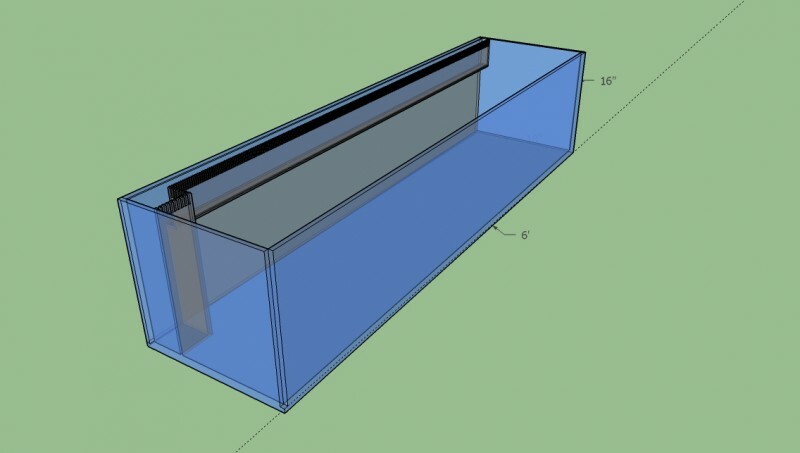 Since my nano reef is a 12G Fluval edge this system would create air bubbles in the top of the tank taking away from its clean aesthetics. 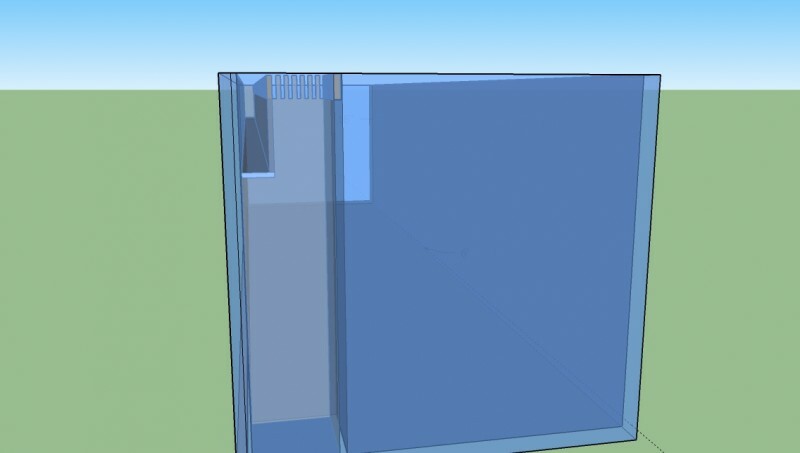 In this system I plan to take out water as the same time i add it. 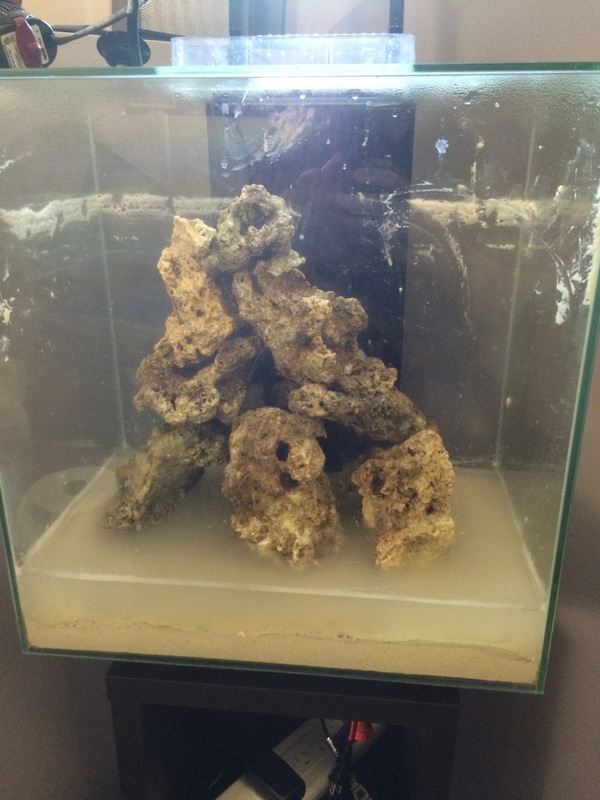 This should keep the water at a consistent level having less impact on the tank while maintaining that elegant look. 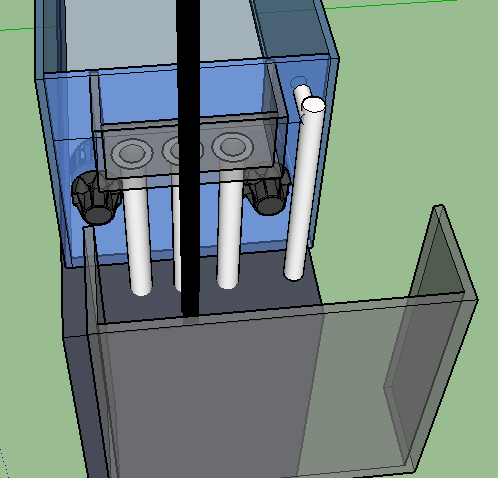 For this project I will being using a triple head dosing pump. 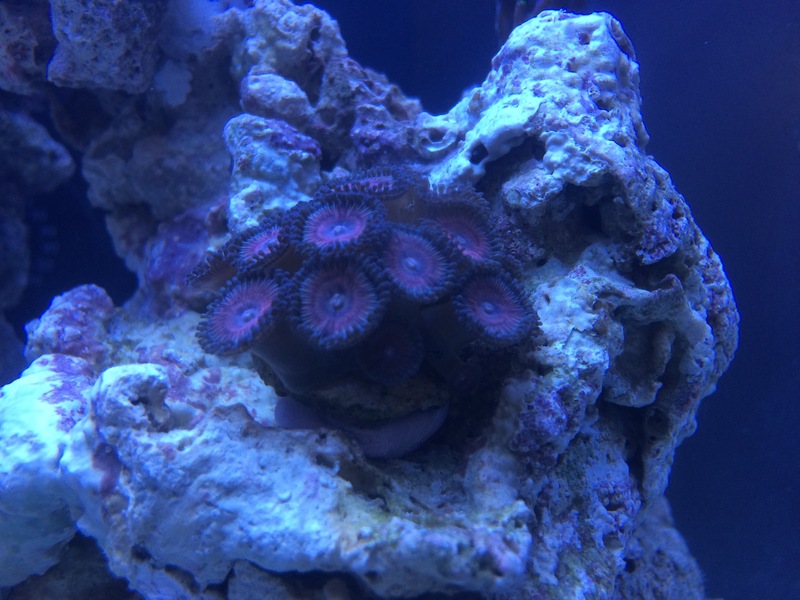 For now we are only going to use 2 of the heads.. however a third may be useful down the road if i ever decide to do a frag tank. and fill it with water taken from the main nano. The pump I decided on an industrial Watson marlow pump which i picked up off ebay for about $55. I originally order some cheaper ones from over seas but worried about how precise they were.. this made me lean towards a higher end pump. 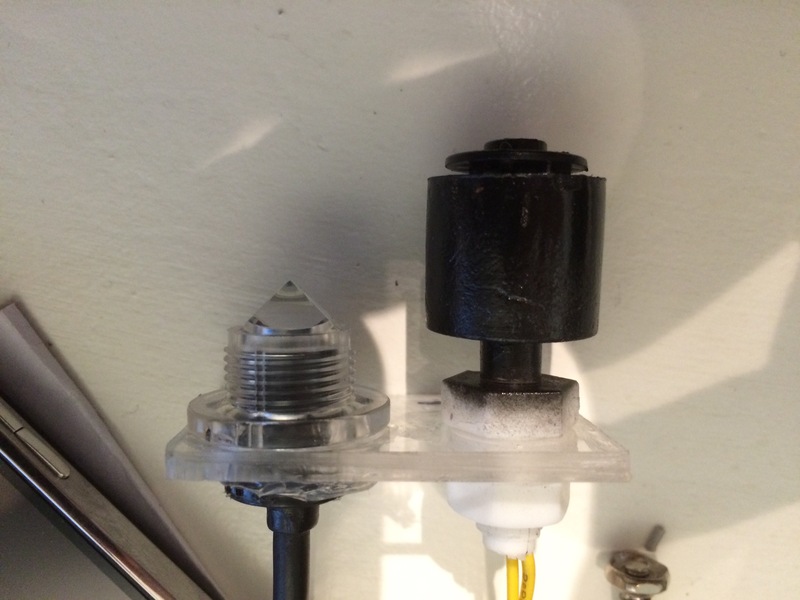 The pump head ever has an adjuster to fine tune the output. 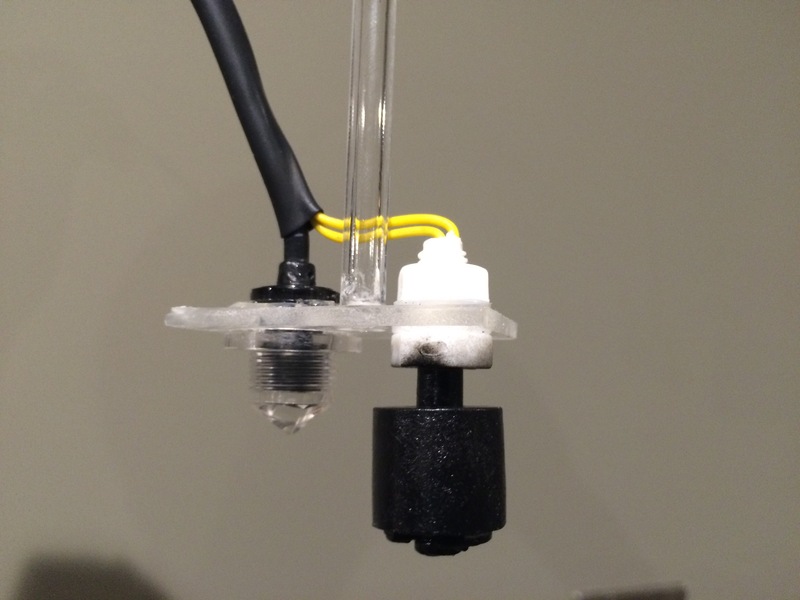 This should allow me to calibrate each line to push an identical amount of water. 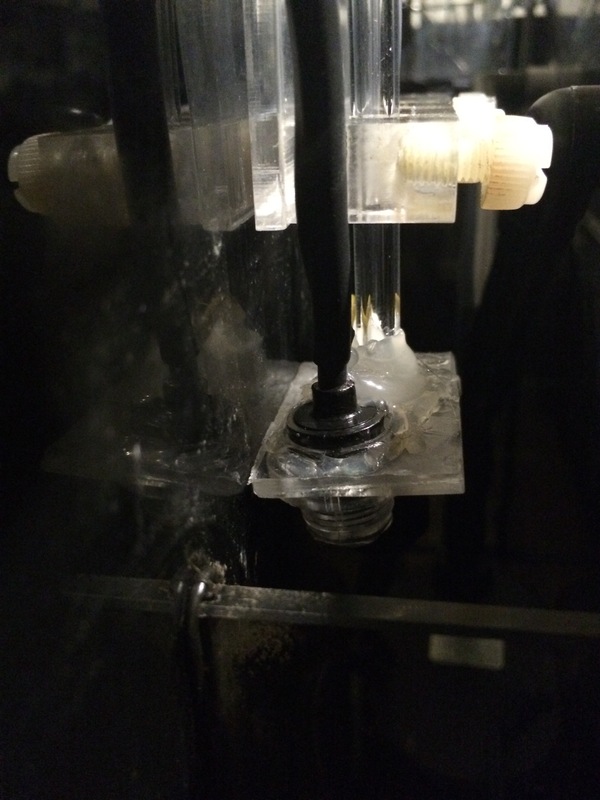 The pump was previously used for what looks like ink so all hoses will be replaced. 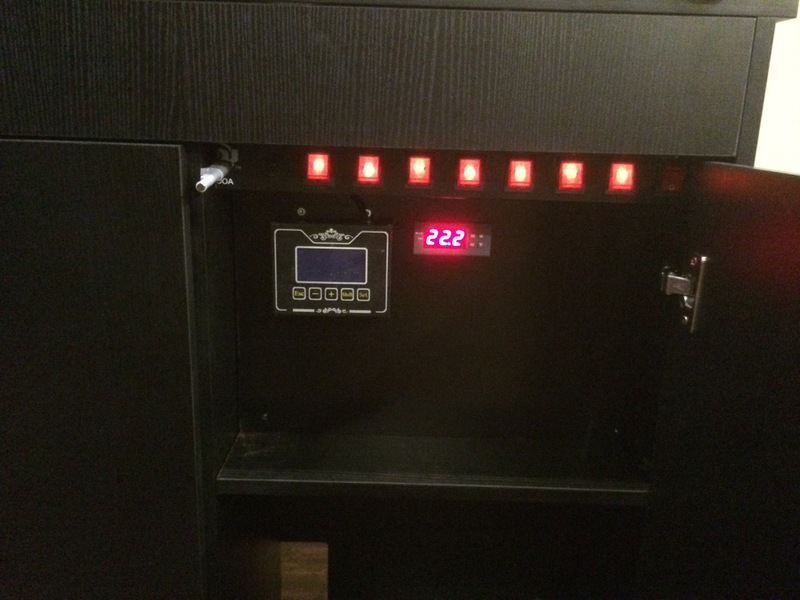 Once calibrated you could automate this with a simple digital wall timer.. however I tend to like safety precautions so I plan on using arduino as my timer with a sensor to kill power to the pump if the water level gets to high. 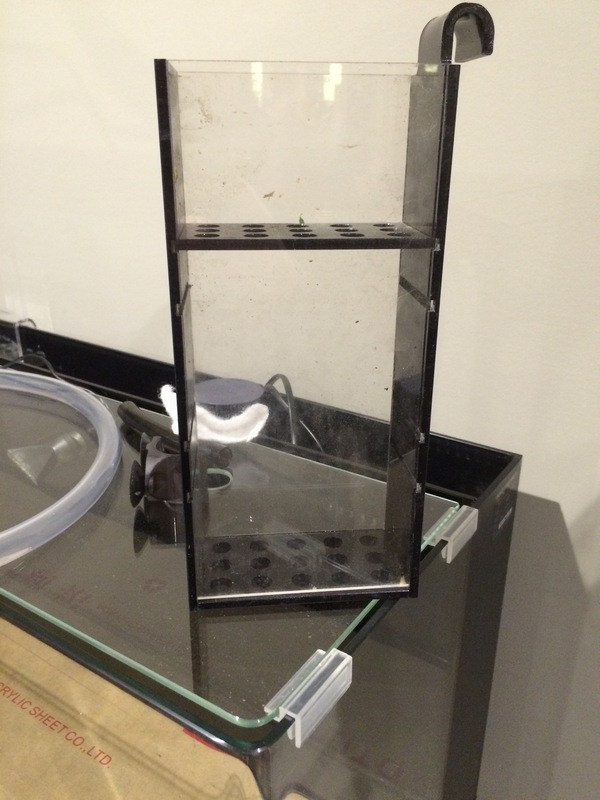 The fluval edge only has a small collar to work with so everything must be precisely calibrated. 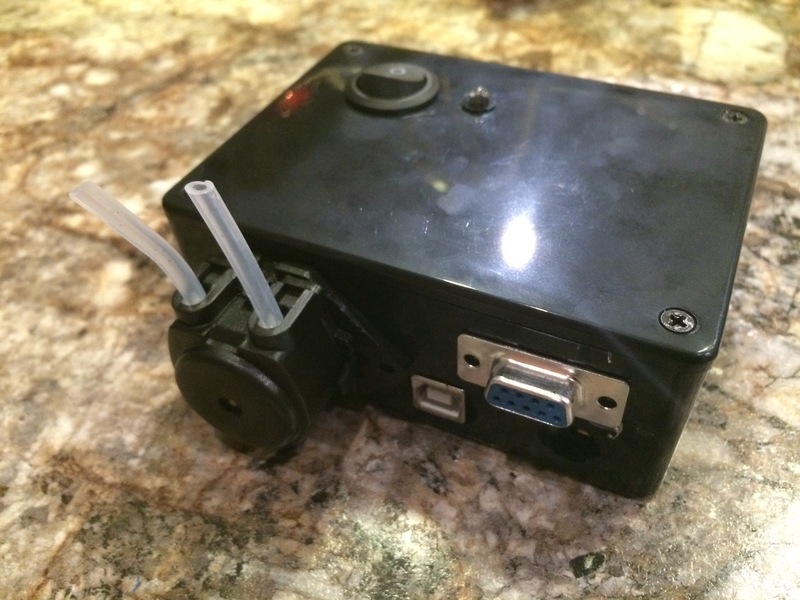 The pump and my optical sensor finally showed up. So far so good for the initial testing. The ensure for the pump side is complete. Not the prettiest but it eo do the job. 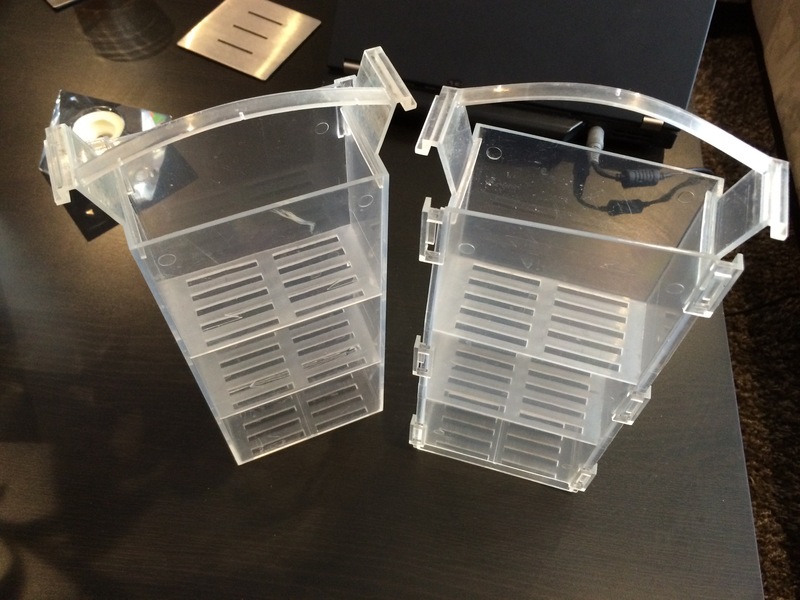 It’s enclosed to keep it quiet and prevent and possible leak! 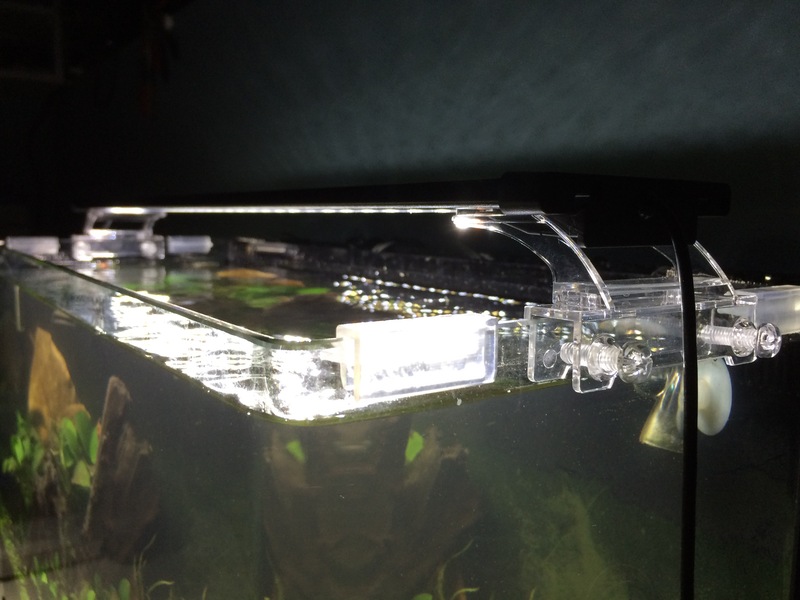 I made a water level sensor holder only to realize my aftermarket led light hits the wires!! Rats. 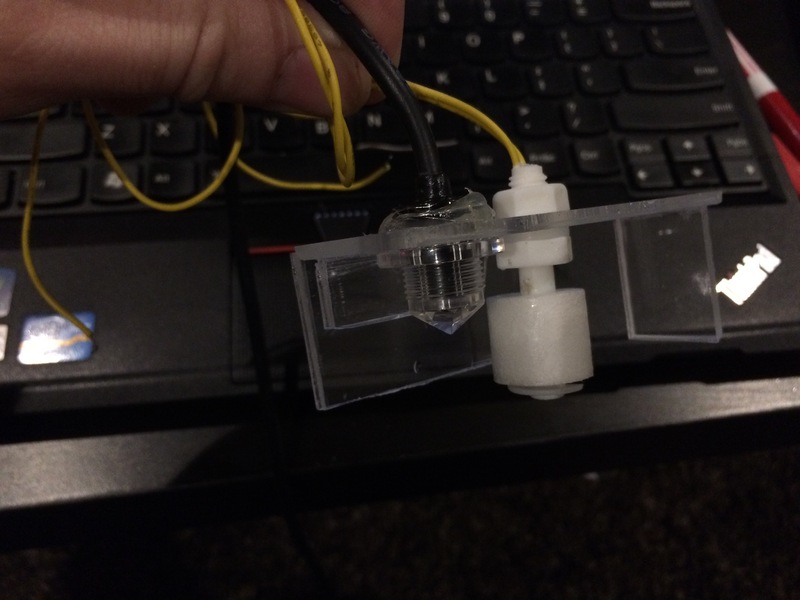 I’ll have to make a second one and hold a sensor on each side of the aquaclear to get around this. Tomorrows project! 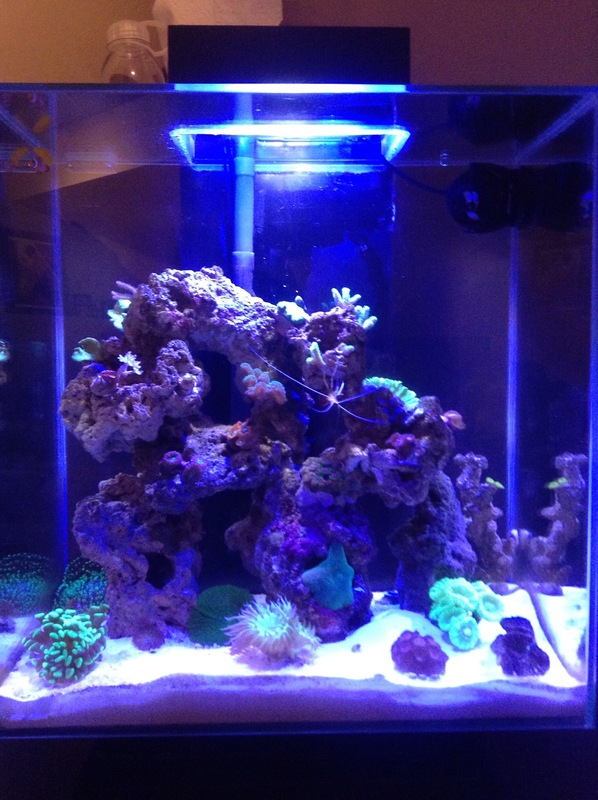 I moved this tank into a Nuvo 24 and no longer had access to a water line. 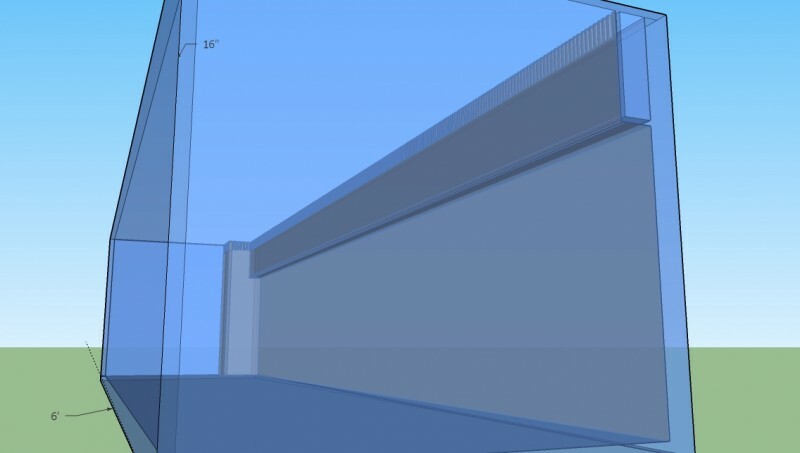 I convertered this into two projects. 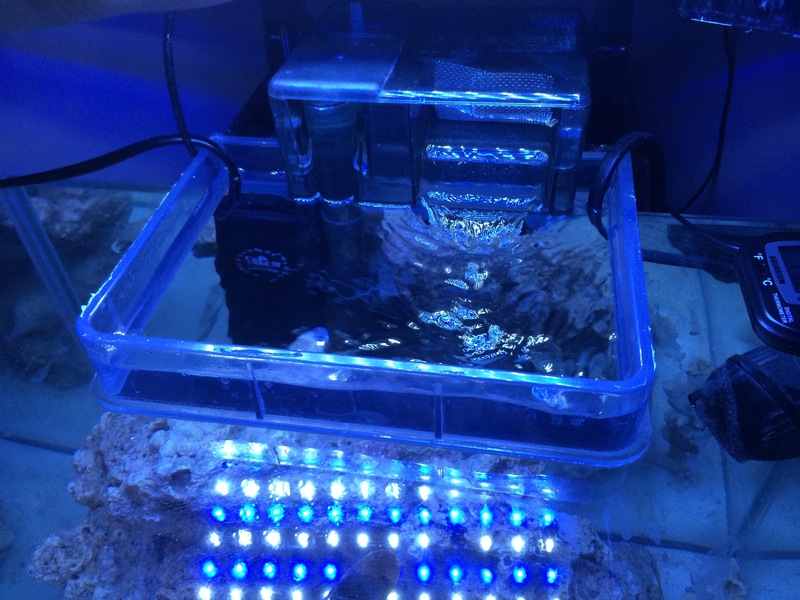 The first is an auto top off (link to come) and an auto water change that works with Buckets. 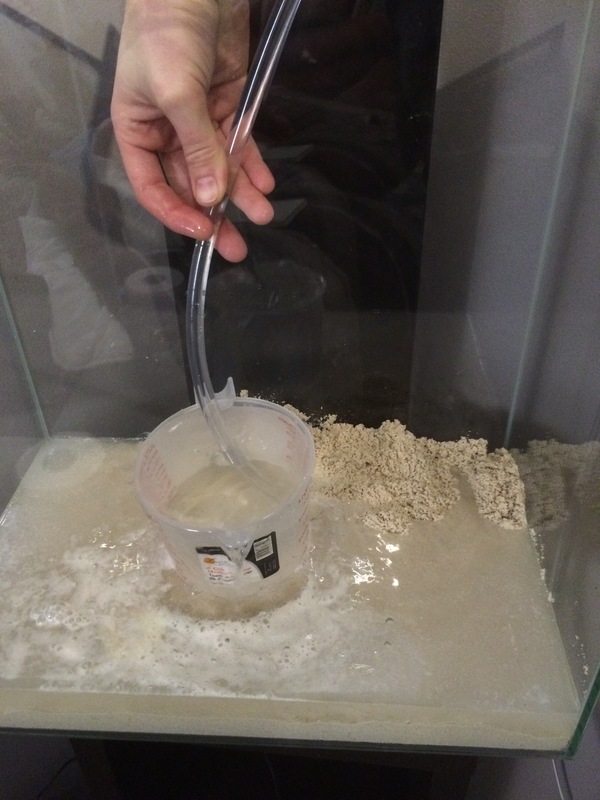 Tank water is pumped into an empty bucket at the same time as water is pumped in from a bucket of fresh water. 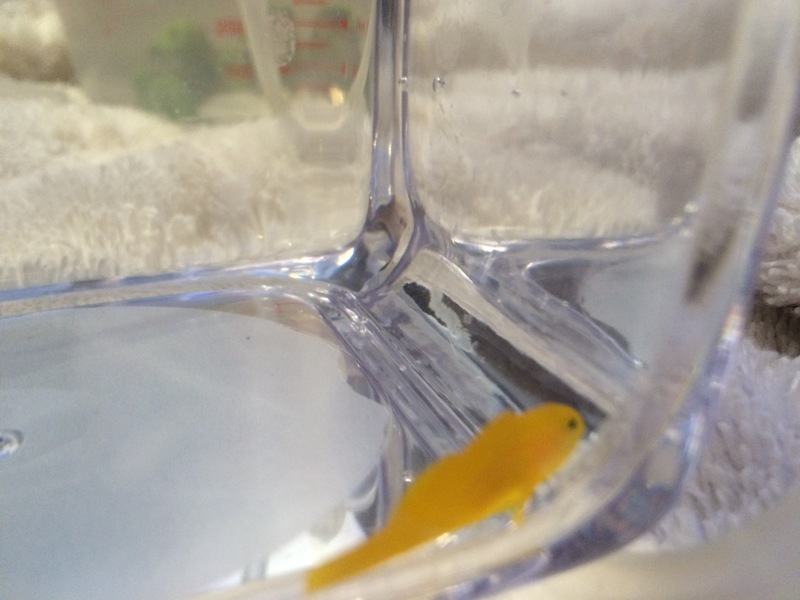 These cute little guys are a nice bright yellow, and fairly active. 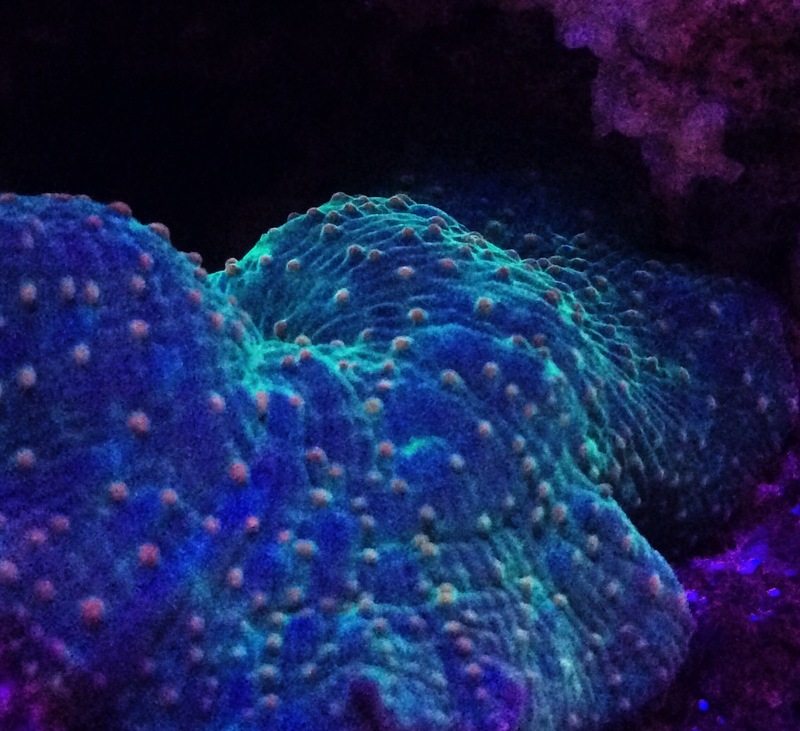 They grow to a maximum of 1.5″ adn are very peaceful. 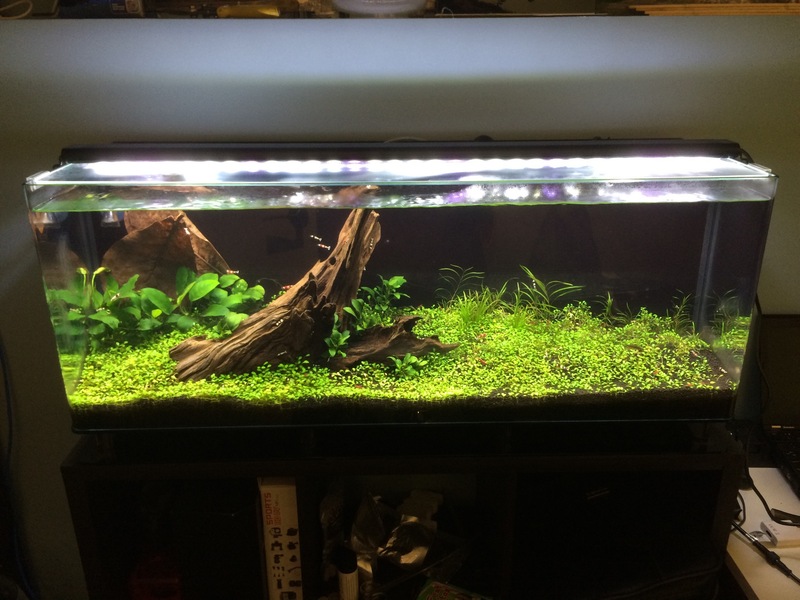 Its recommended to have a tank that is a minimum of 10G. Having now had one for a few weeks, they are extremely cute but picky eaters. 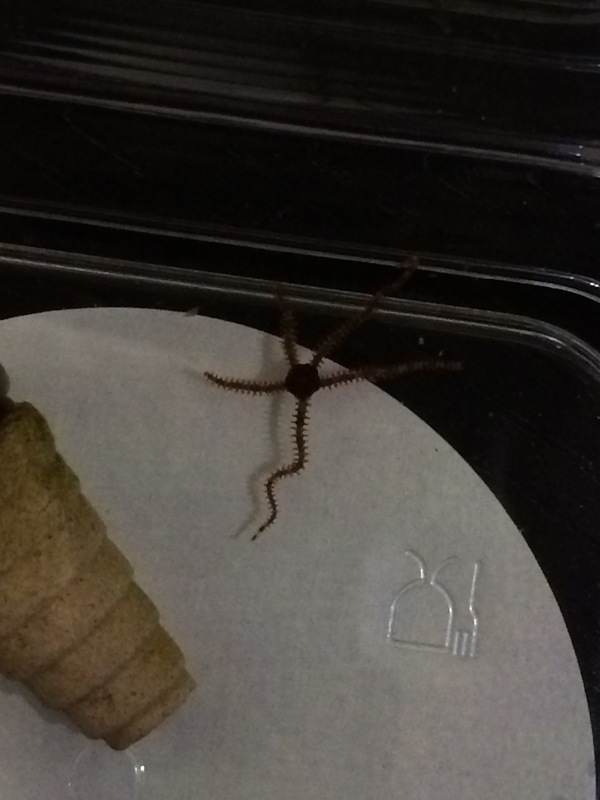 So far mine only really likes to eat mysis. 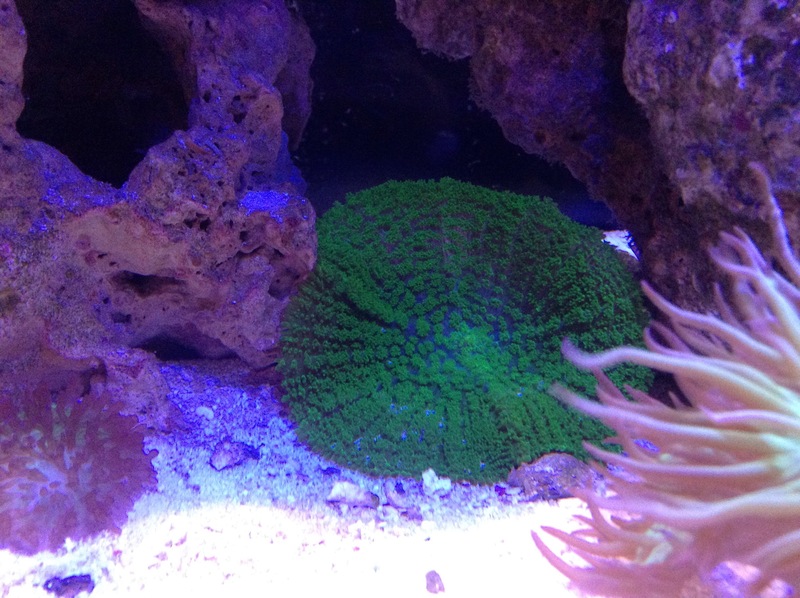 The only other downfall is they may nip at the polyps on SPS corals. 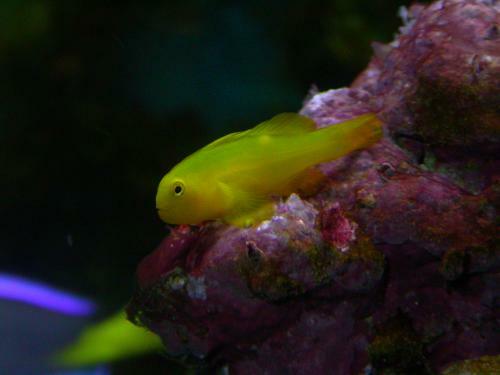 Green Clown Gobys are another small nano fish that will only grow to about 1 3/4″ They are fairly peaceful and will be happy in a tank 10G or larger. 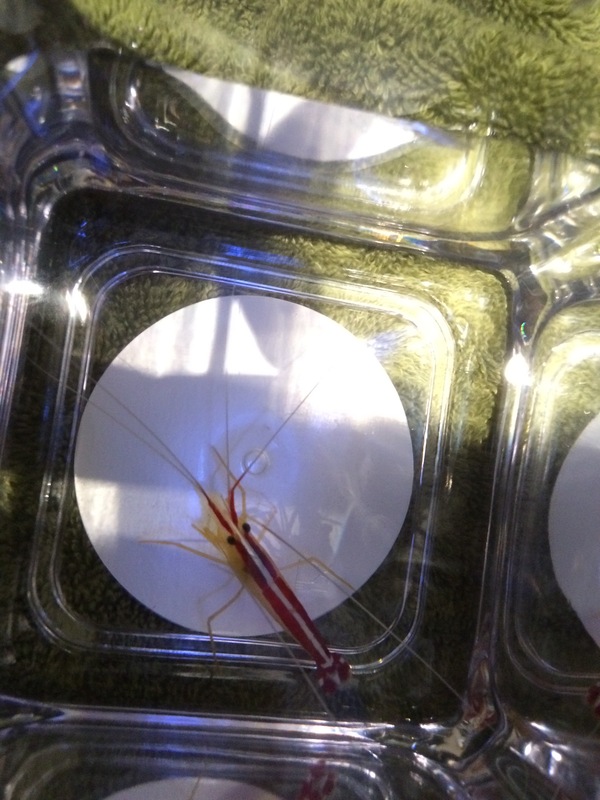 Their diet is similar to the YCG above and enjoy meaty foods such as mysis, brine shrimp and other frozen foods. 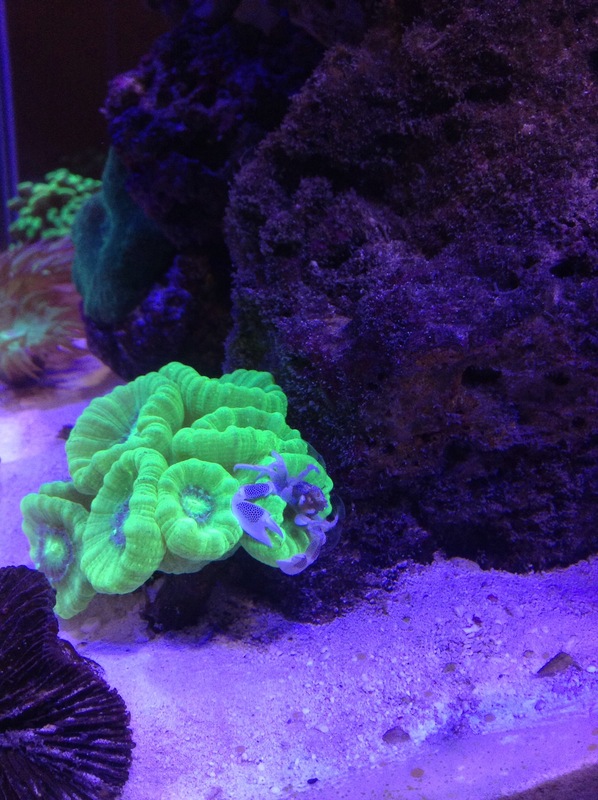 I have always been wanting to try my hand at saltwater and decided a nano reef for the bedroom would be delightful! 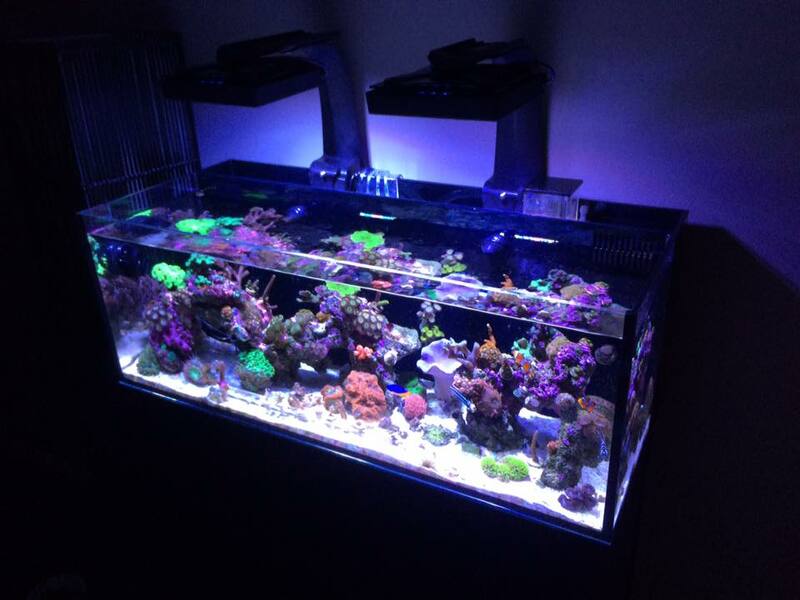 Now most people say saltwater is hard and to start with the biggest tank possible.. 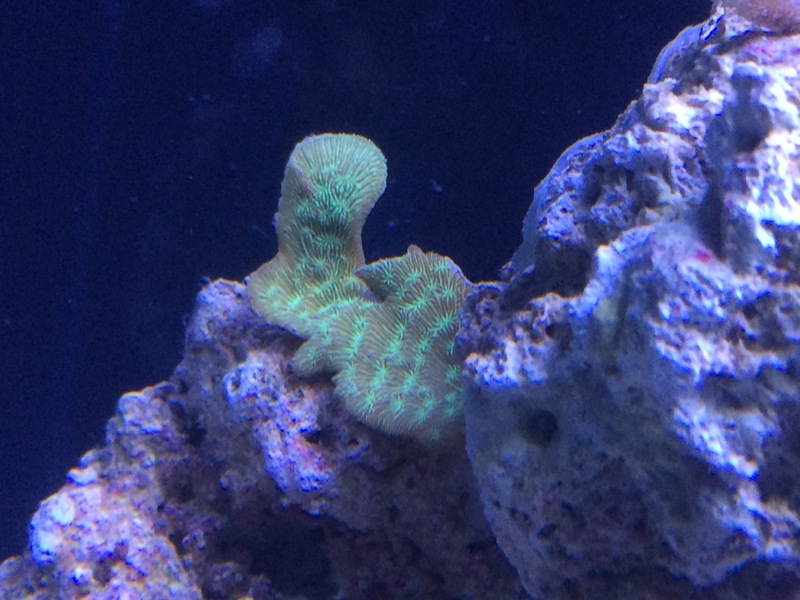 I plan to debunk that myth that holds many pople back by doing a nono (questionably pico) reef as my first reef tank. 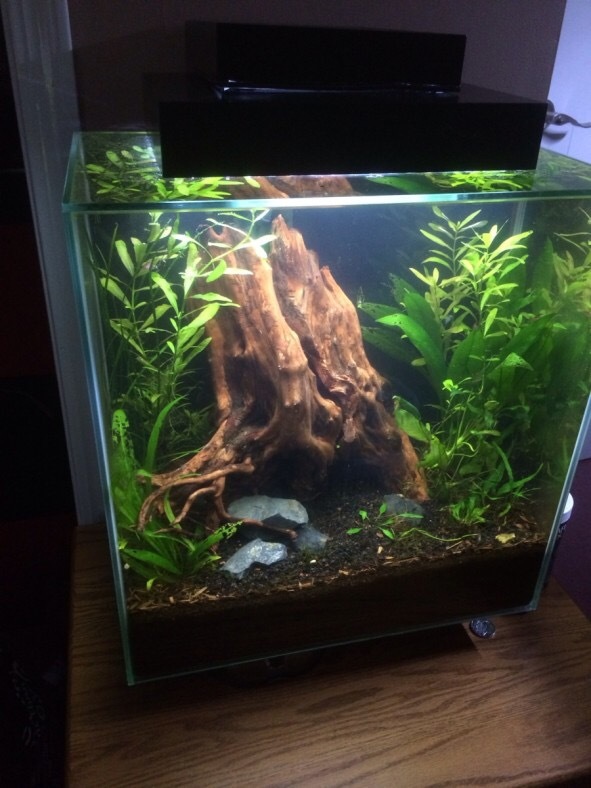 Ideally you would want to start with a marine tank.. for some strange reason i decided to go with a freshwater tank, this is likely because i had spent months dry starting a freshwater shrimp tank out of my actual marine tank the 24g lost shrimp city. 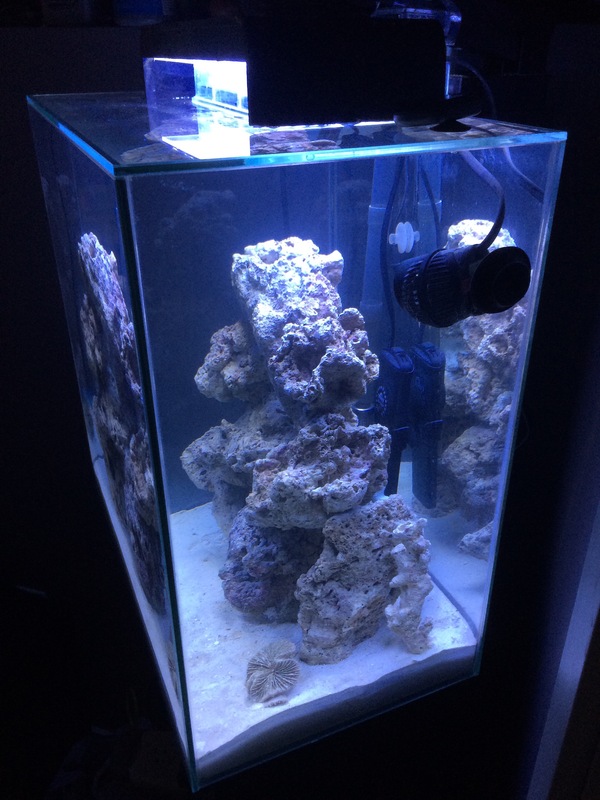 The tank used there was an innovative marine nuvo 24 which is a beautiful bent glass aquarium. 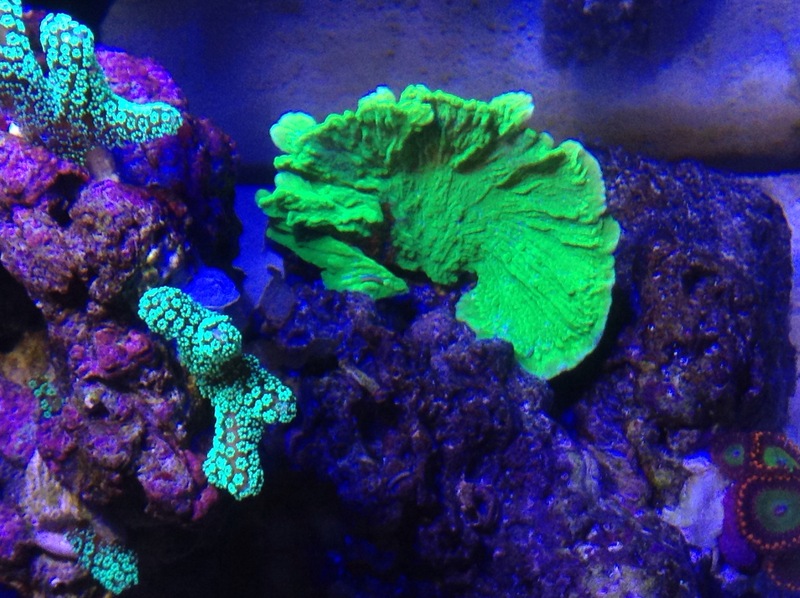 If i ever break it down.. i’m sure it will end up as a reef. 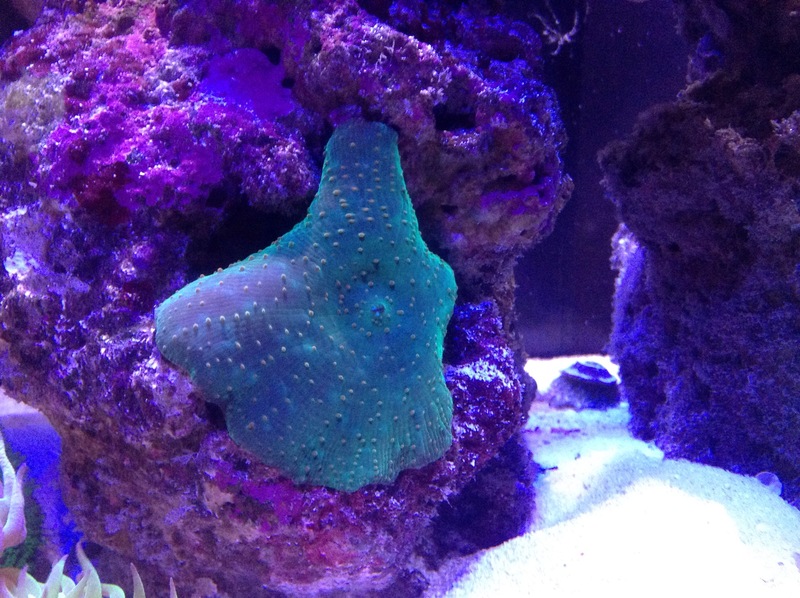 With the former inhabitants in there new home it was time to clean out the tank. 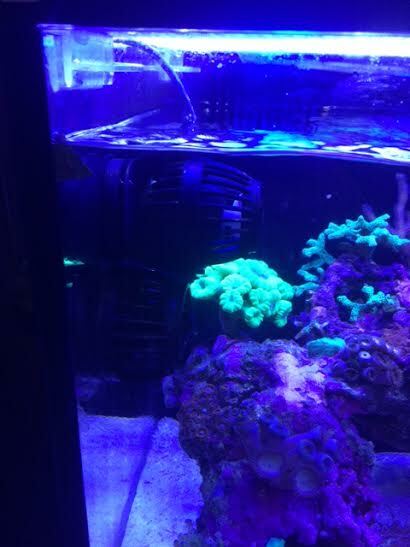 I find using water and a 2″ stainless razor the quick and eay way to clean a tank.. about 20 minutes of cleaning the tank looked good as new. 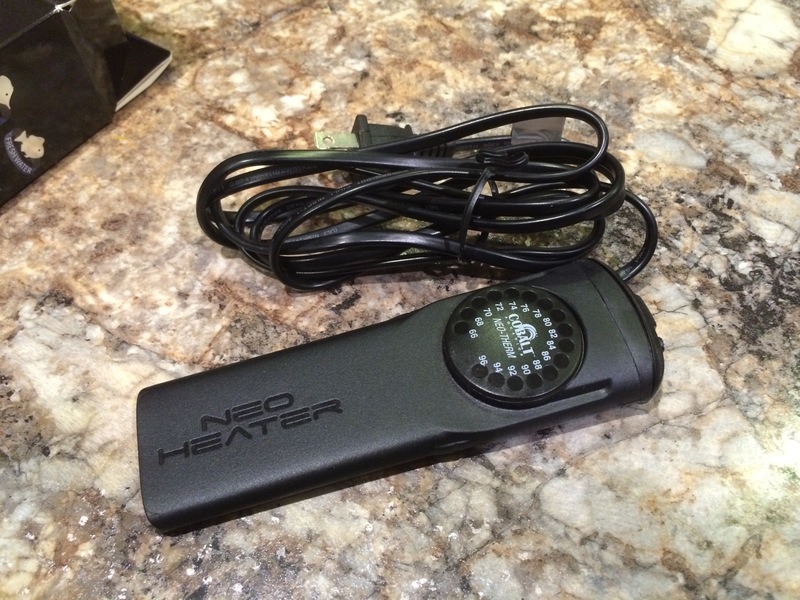 For the heater i decided to go with the Cobalt Aquatics Neo-Therm 75-Watt heater as its has a digital thermostat for added reliability and is super thin to take up minimal tank space. 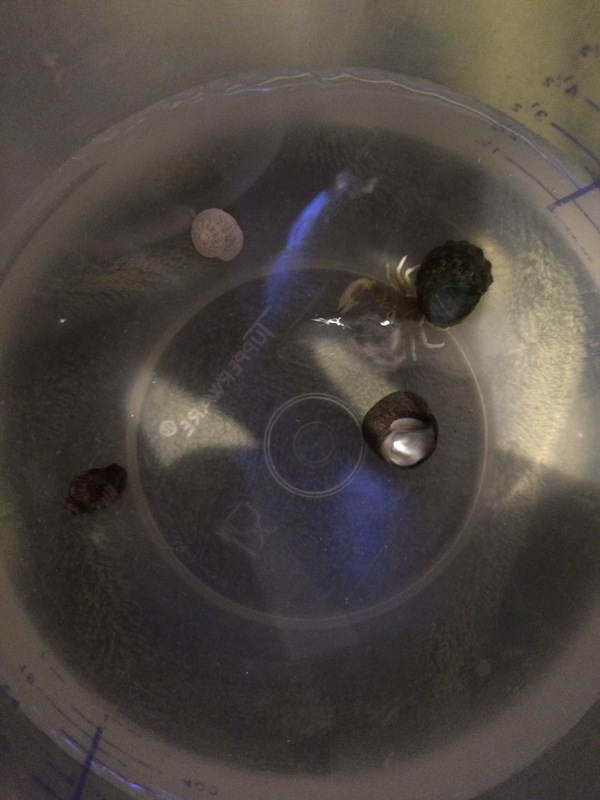 I then added about half a bag of live sand. 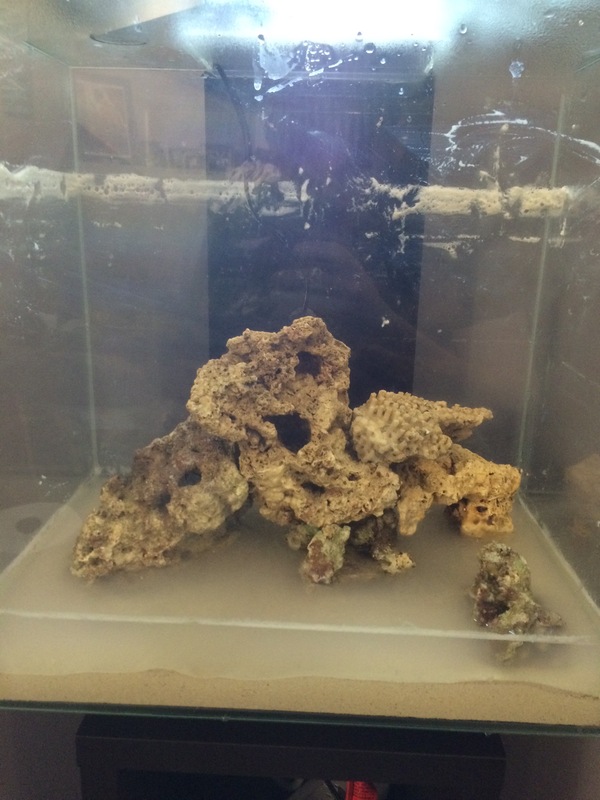 Being a small tank and myself being a tad impatient i decided live sand/live rock were a must to get the tank up and running in a reasonable amount of time. It only took about half a bag (10lbs) to fill the tank. …and the journey to the dark side begins! 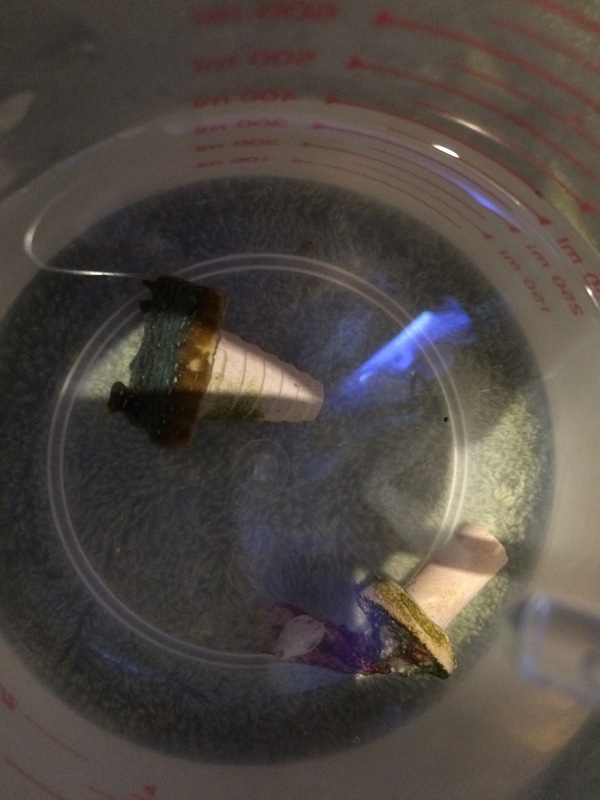 In freshwater you have your fitler with ceramic media and sponges as your biological filter. 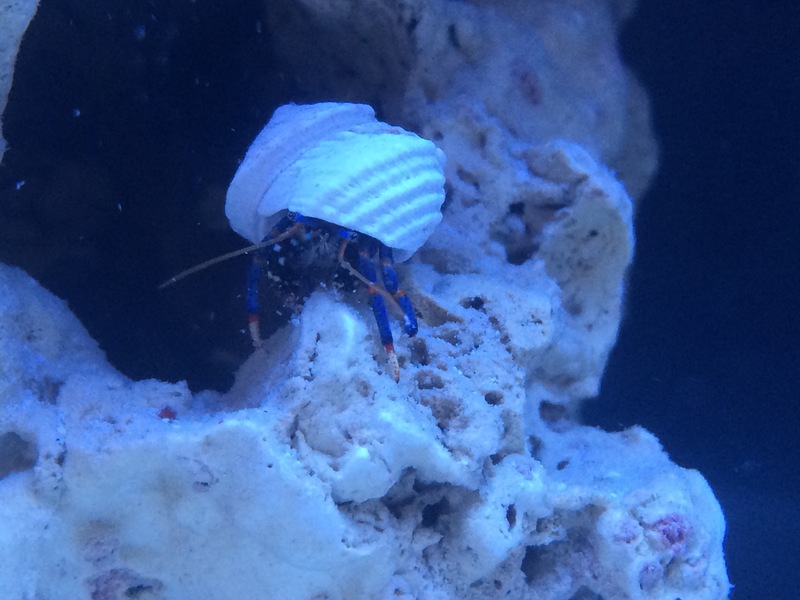 In marine tanks the rocks is your main filter. You can start with cheaper base rock but you will be waiting along time for the rock to colonize with bacteria and become alive. 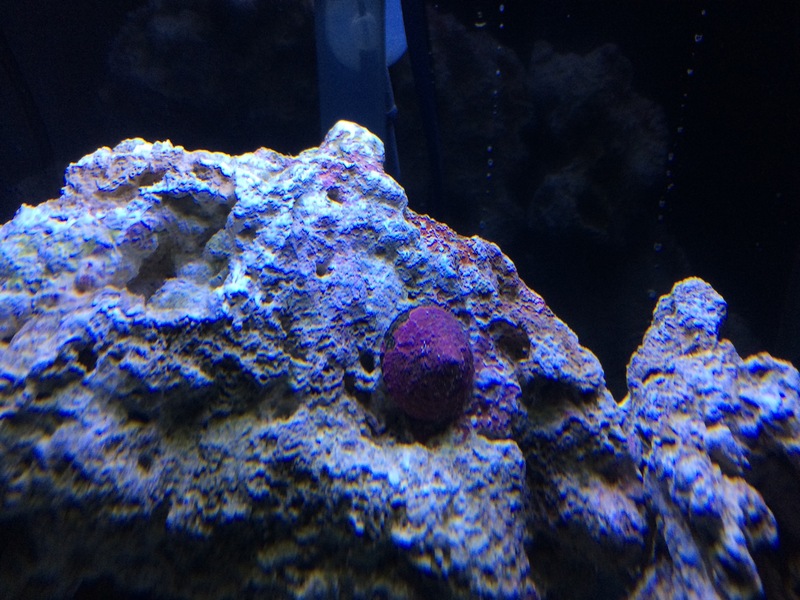 Being such a small tank i decided to go all out and stock it with 100% live rock from the beginning. 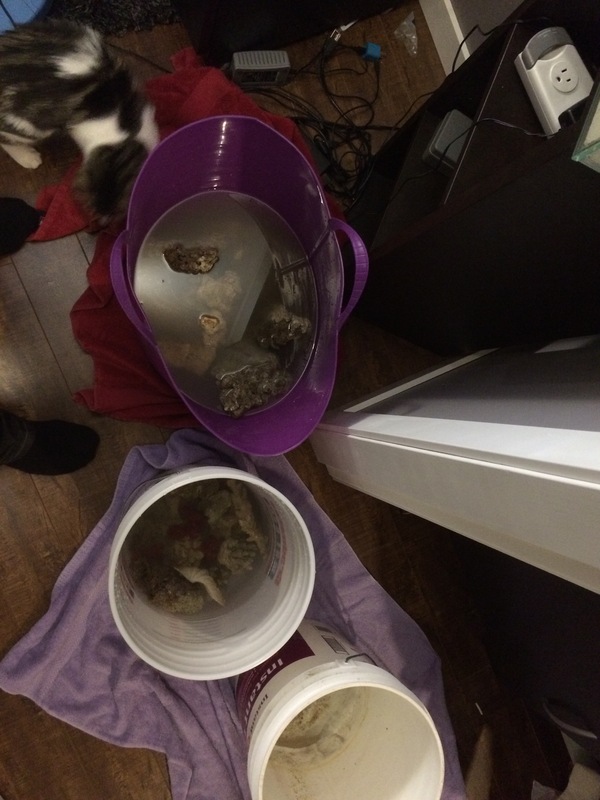 I went a little overkill buying 20-25lbs of live rock through a classified add. 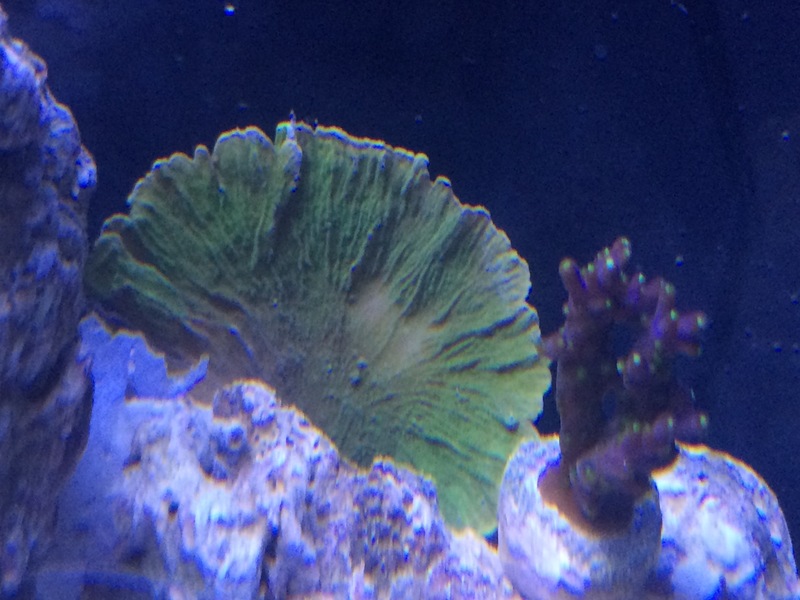 The rock came form an establish tank and was fully live/cured! Perfect to jump start the cycle on a new tank. Its been just shy of a month since my journey began. Looking back at the original rockscape i see how bad my designs were.. 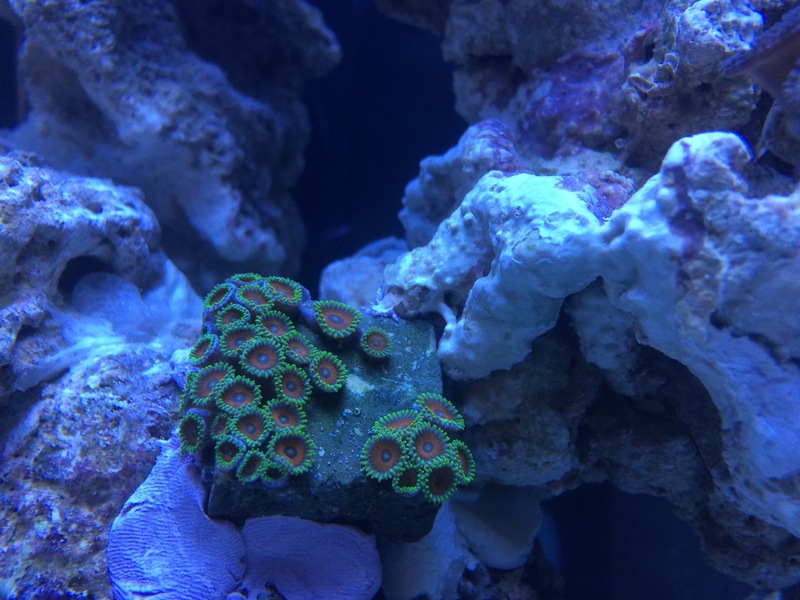 I must have re-scaped the rocks atleast 50 times before i settled on something i like.. and in ta tank like this with only a small opening to work through it can be a huge PITA.. that being said im very pleased with the end design. 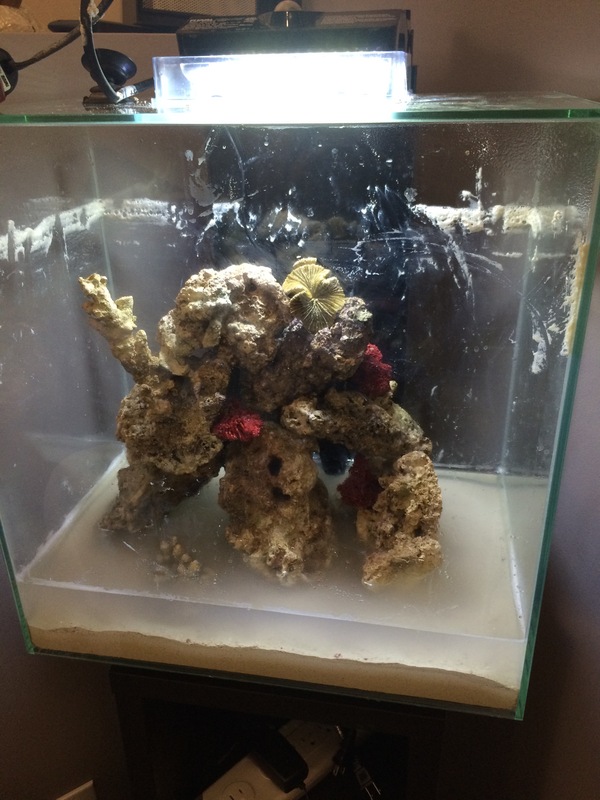 When creating your scape be sure to leave space around the edges to properly clean the glass. I finally got my custom UltraBrite Led System which is a huge upgrade over the stock light. 2 days before Christmas.. 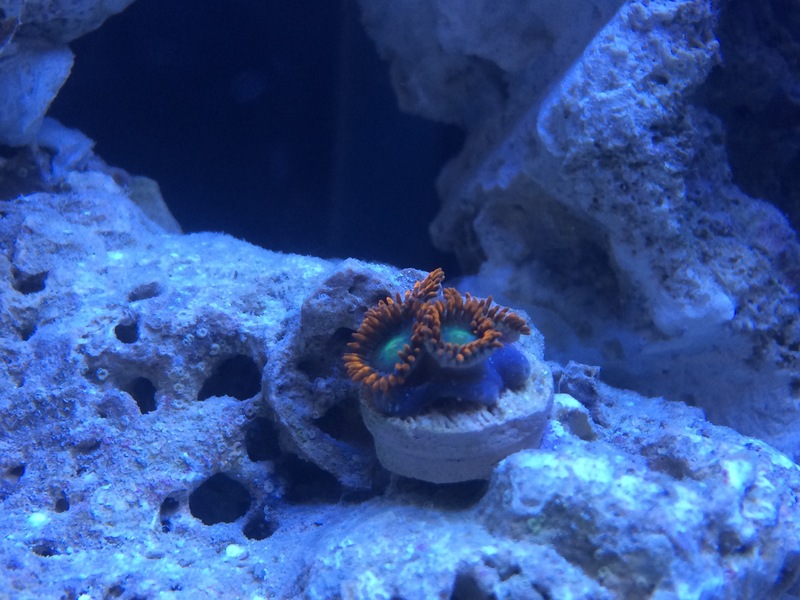 The next day my impatience got the best of me and I picked up a small purple bonsai sps and an alpha/omega zoa which came complete with a bonus bristle star wrapped around it! 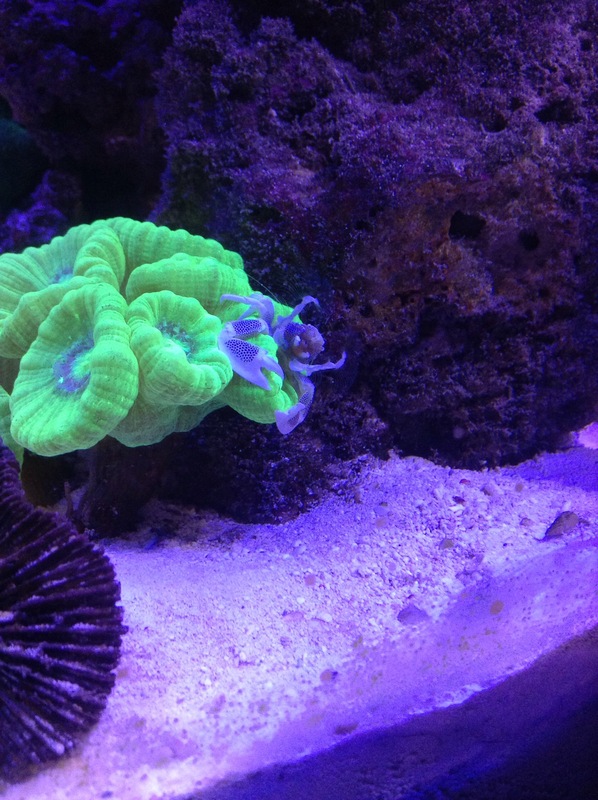 One of the amazing things about corals is many of them contain a floss-florescent pigment that makes them glow under the uv spectrum. 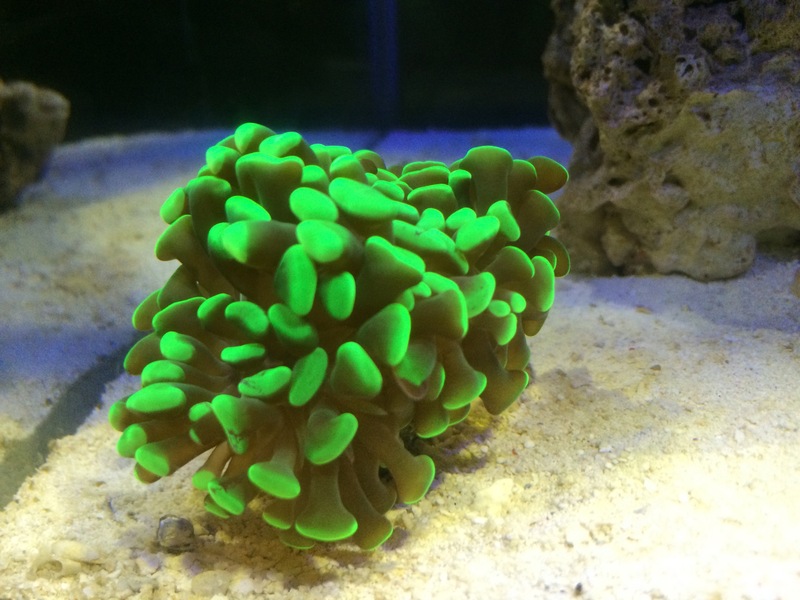 I absolutely loved the glow and started to hunt down corals to light up my tank like a black light party at night! 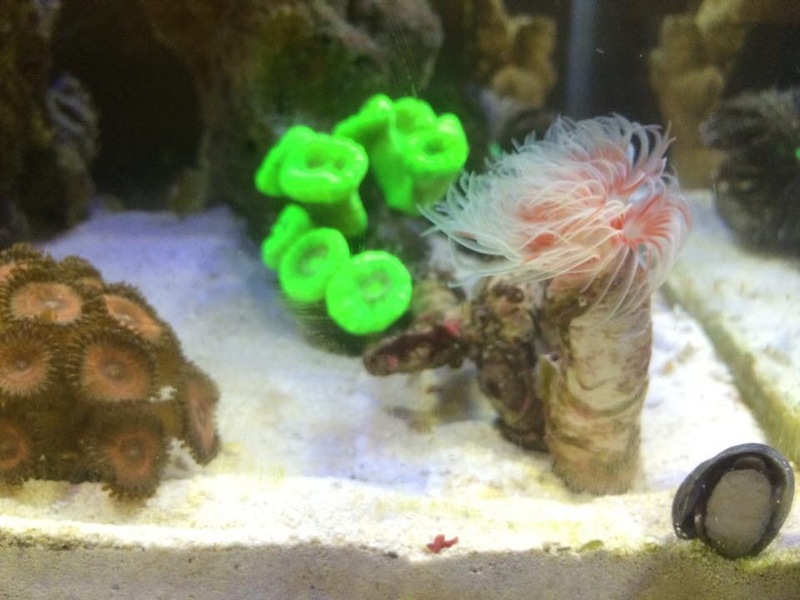 I meet another local reefer who was kind enough to show me her tank and hook me up with some more frags to get me started! 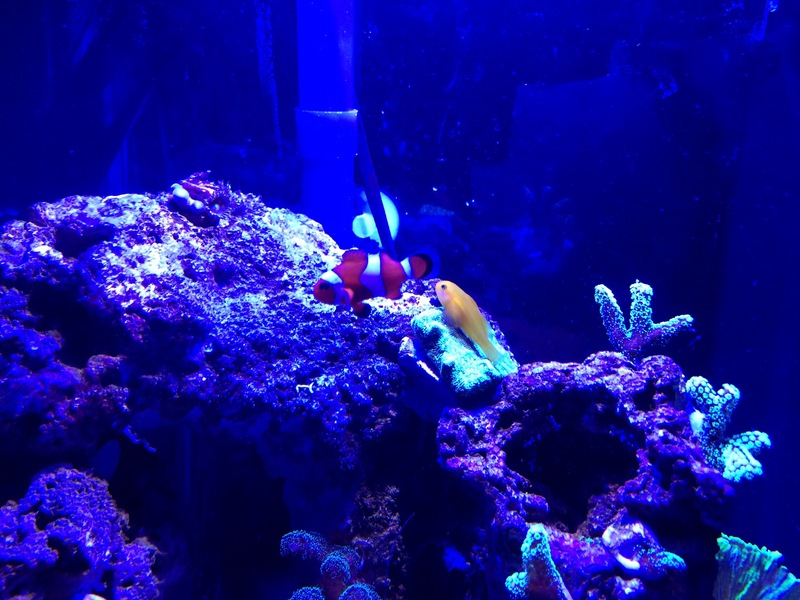 Last night I decided to get my little yellow clown goby a friend and picked up a baby perc clownfish. 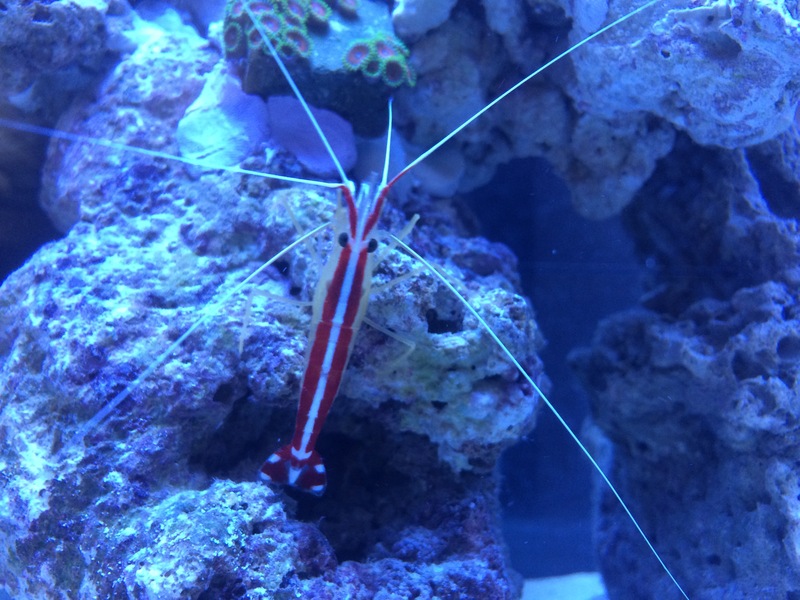 Very cute little guy! I’m start to see lots of new growth and new palops. So exciting! Time to add a little more color!